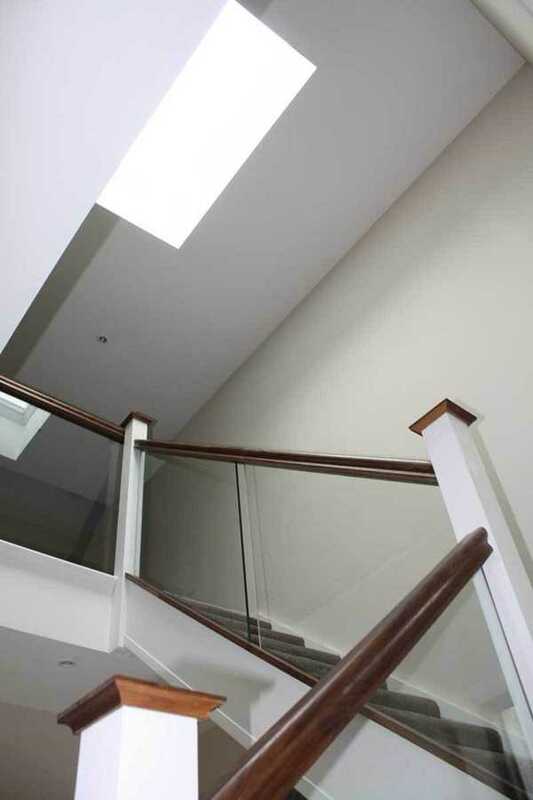 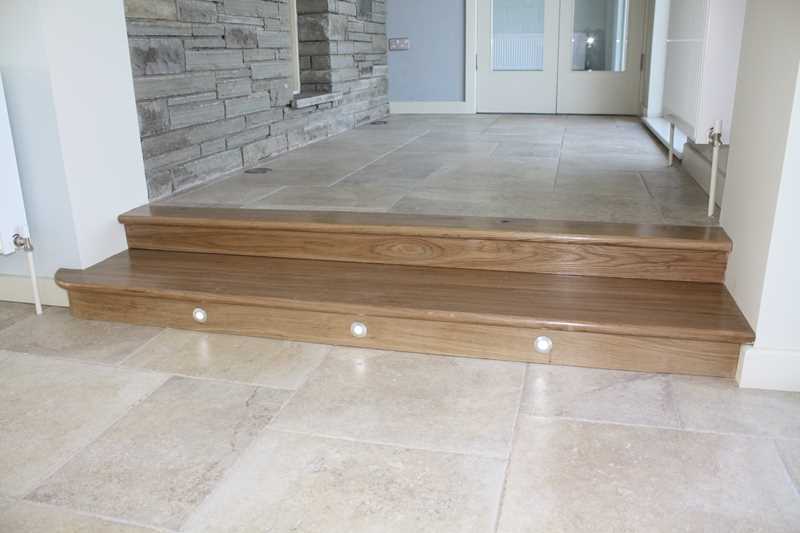 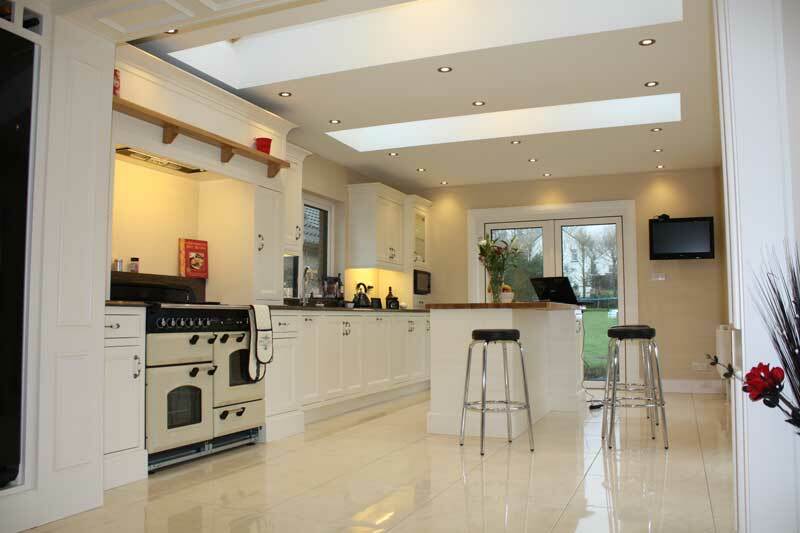 Below are a small proportion of the projects we have completed over thirty years in business. 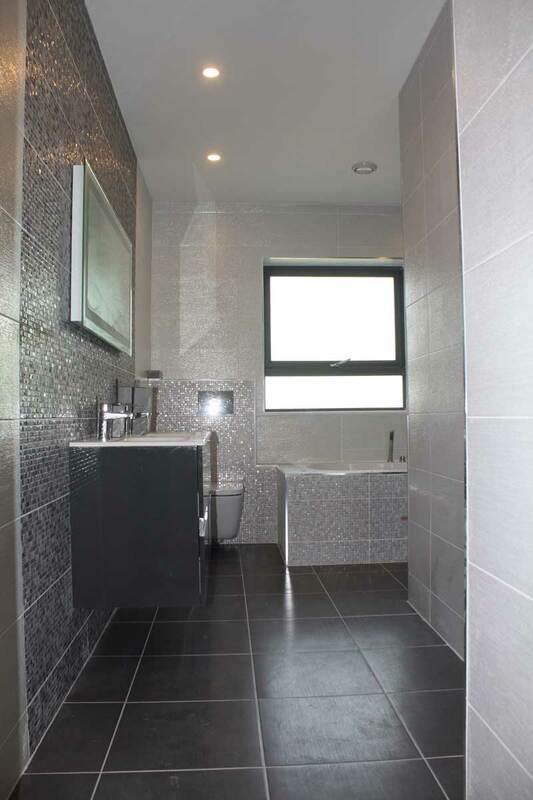 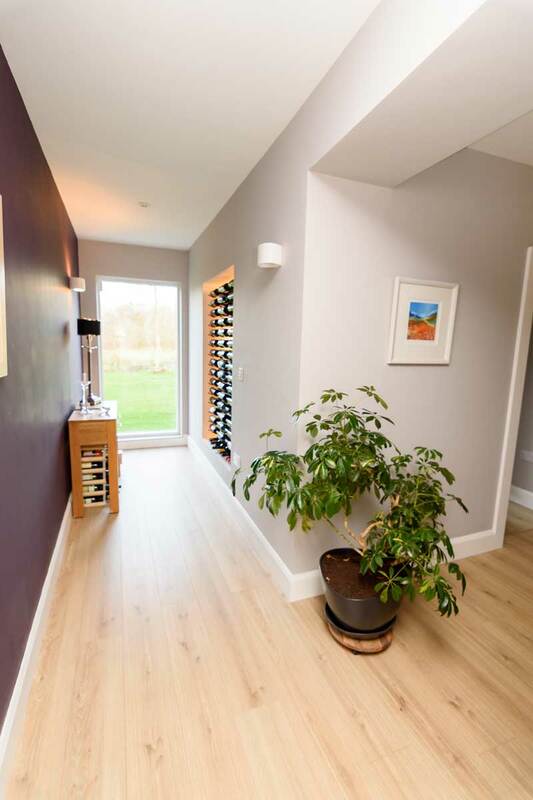 Each image has a pop-out description, additional images in a slide-show and a ‘View More…’ button that takes you to a ‘Tear-sheet’ on the project. 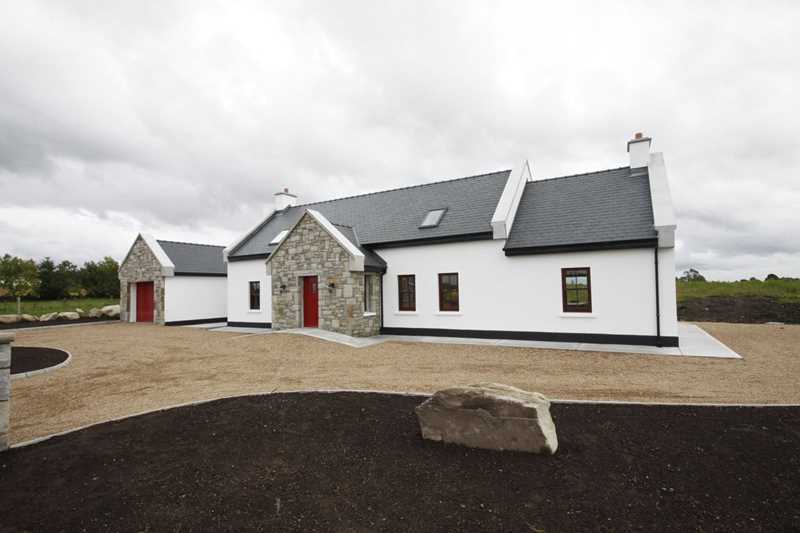 This 'barn' roofed two storey extension to a traditional single storey Irish cottage added vital living, kitchen and bedroom accommodation for a family in County Mayo. 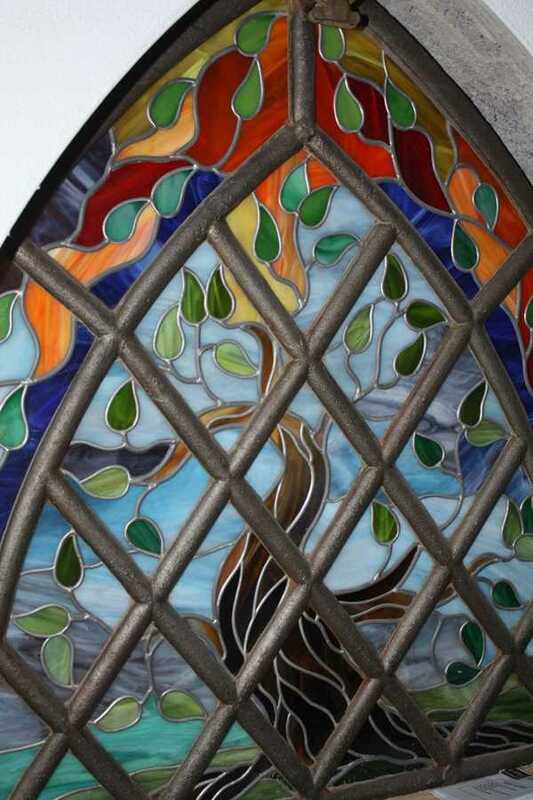 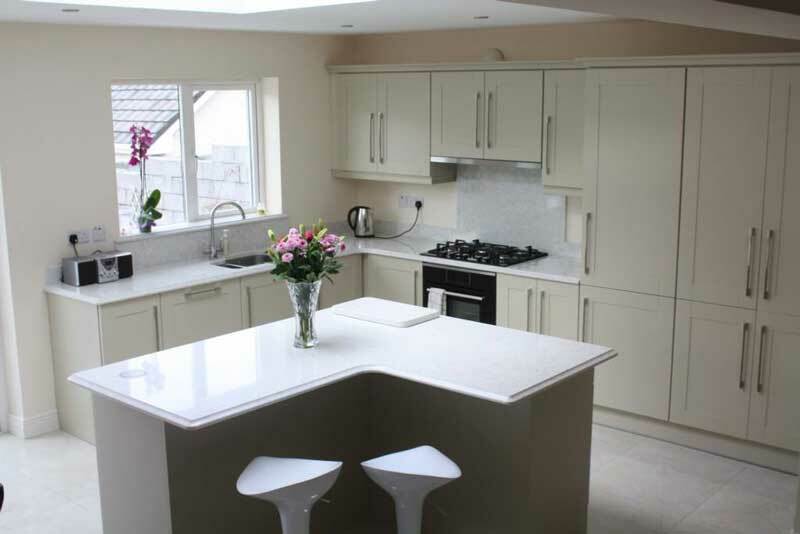 Click on the 'View More' button below to open the 'Tear Sheet' on this project. 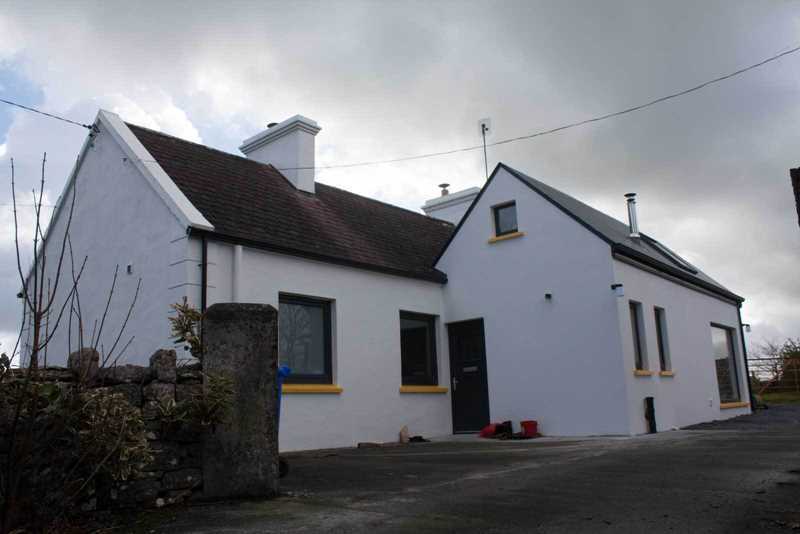 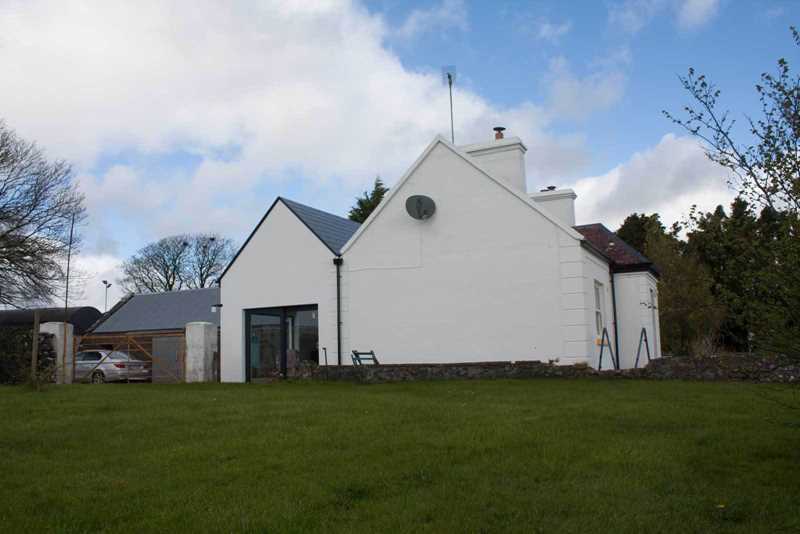 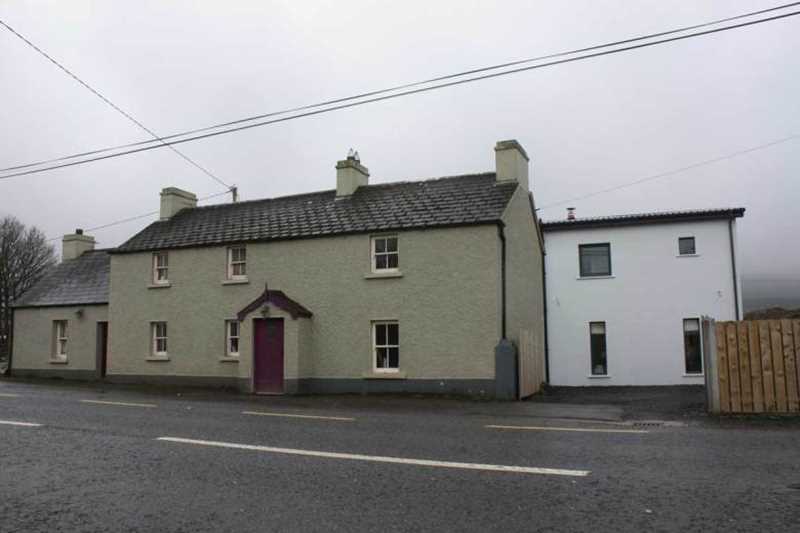 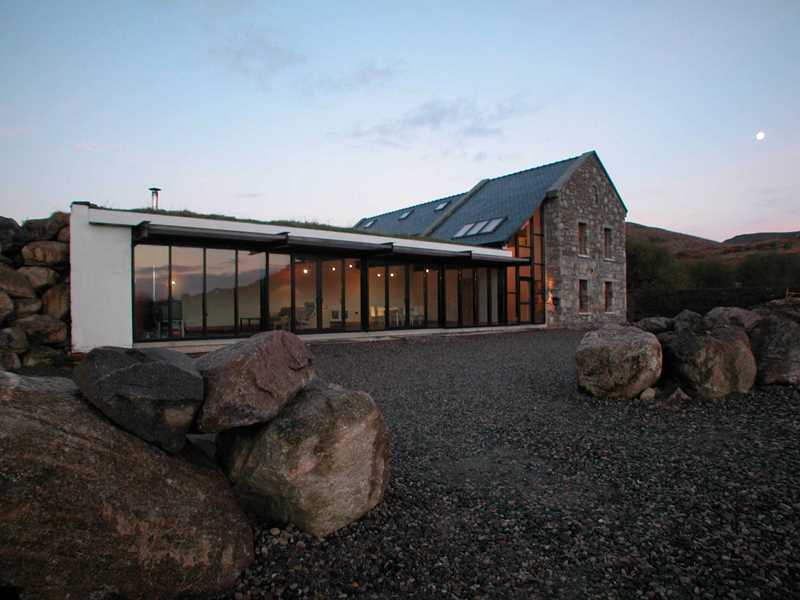 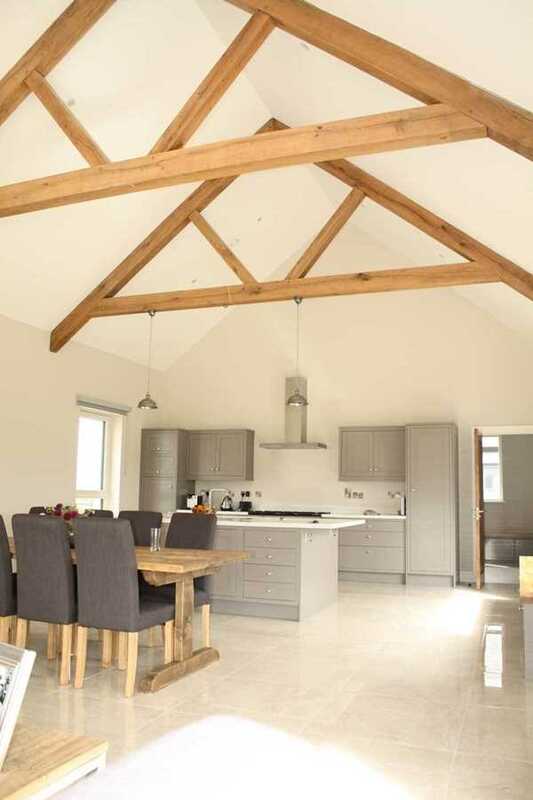 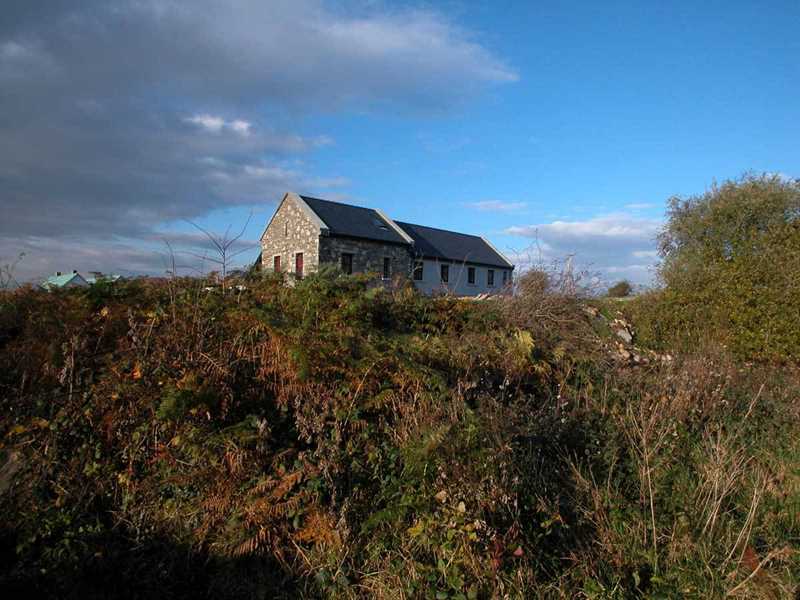 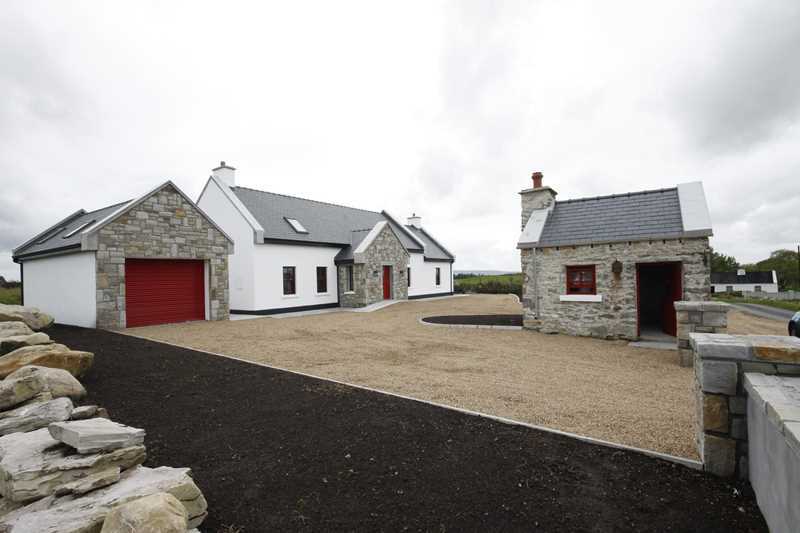 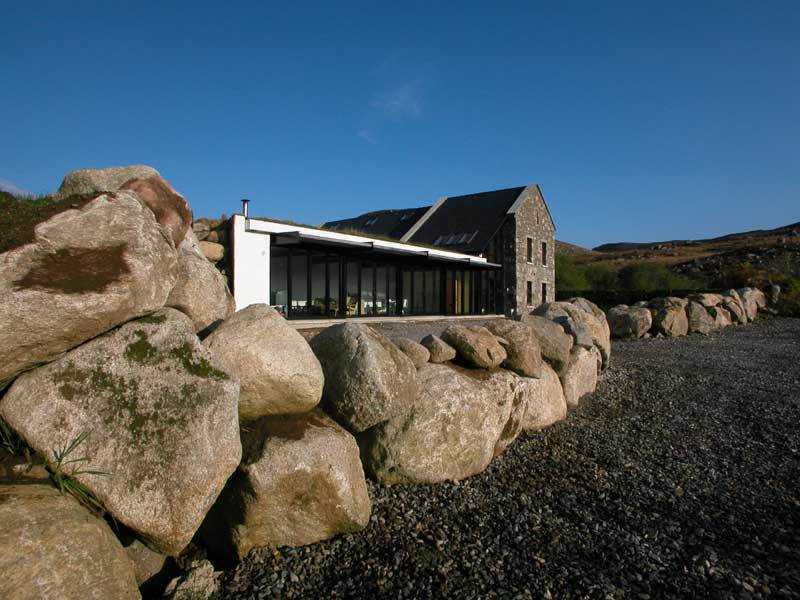 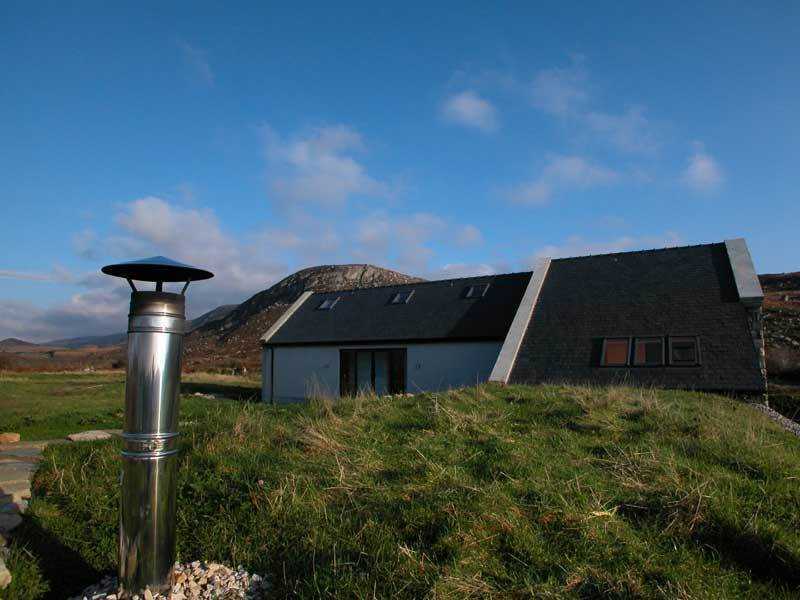 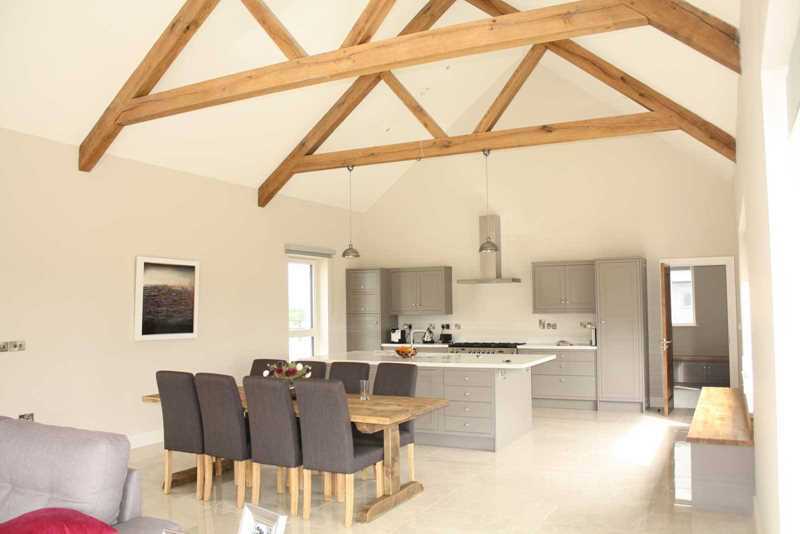 This project included a new dwelling house (in a traditional style with contemporary twists), the restoration of the Swinford Cobbler's Cottage and a garage. 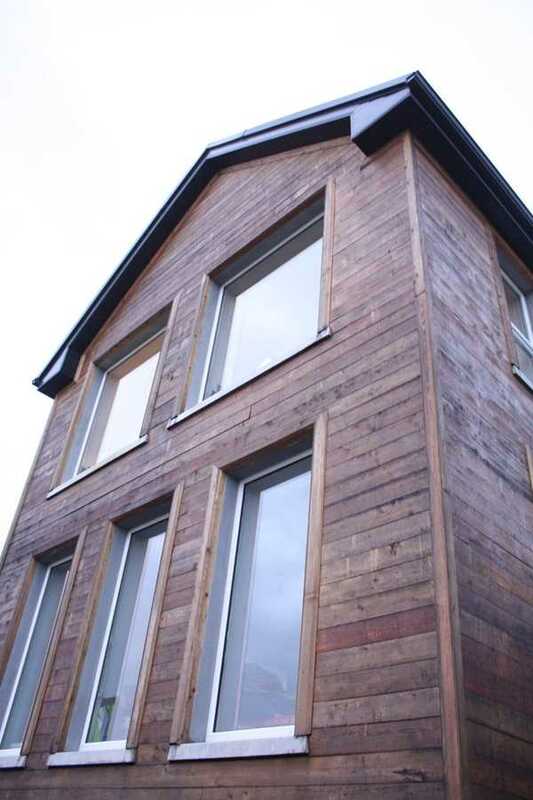 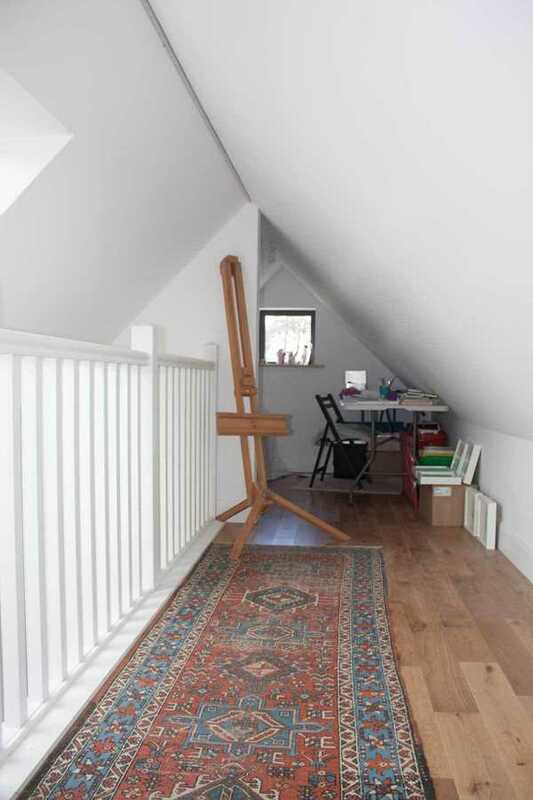 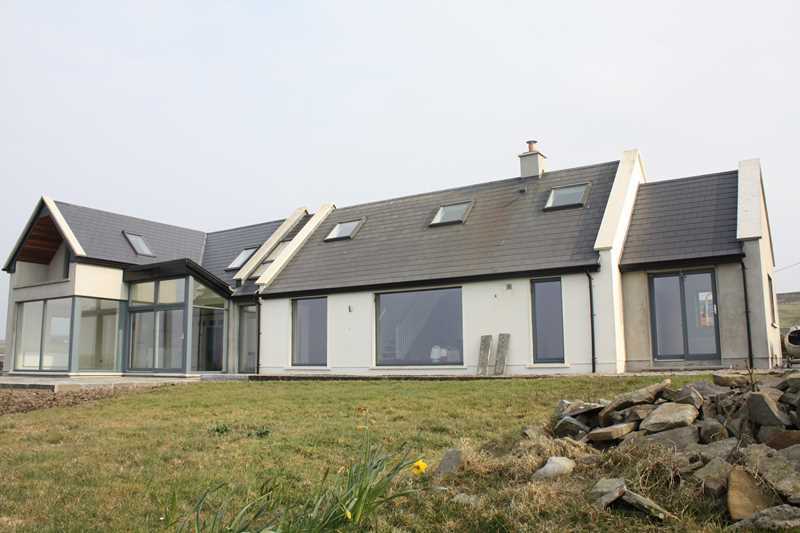 The restoration was undertaken with traditional materials such as lime and lime render whilst the new house is A-rated designed and built in a traditional style from the front but maximising solar gain to the rear. 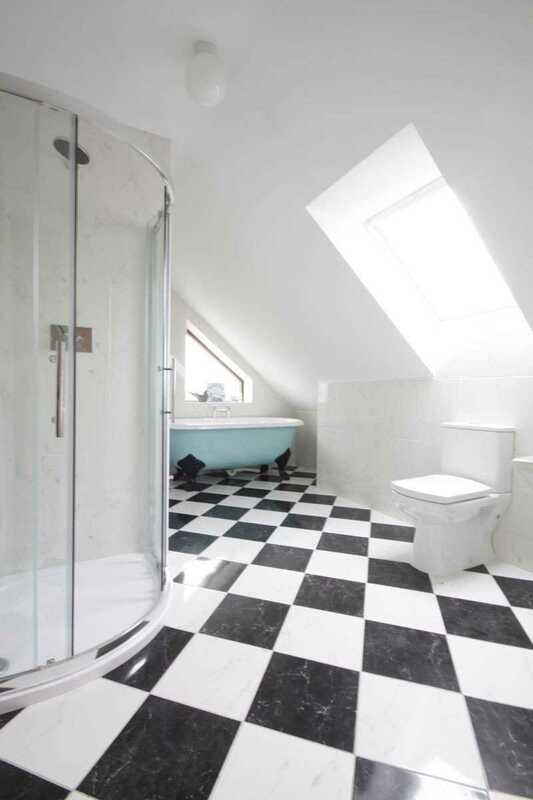 Click on the 'View More' button below to open the 'Tear Sheet' on this project. 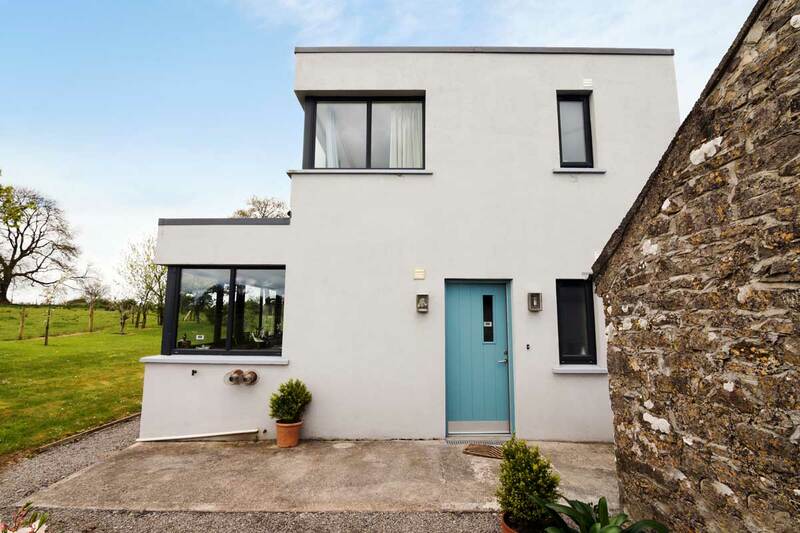 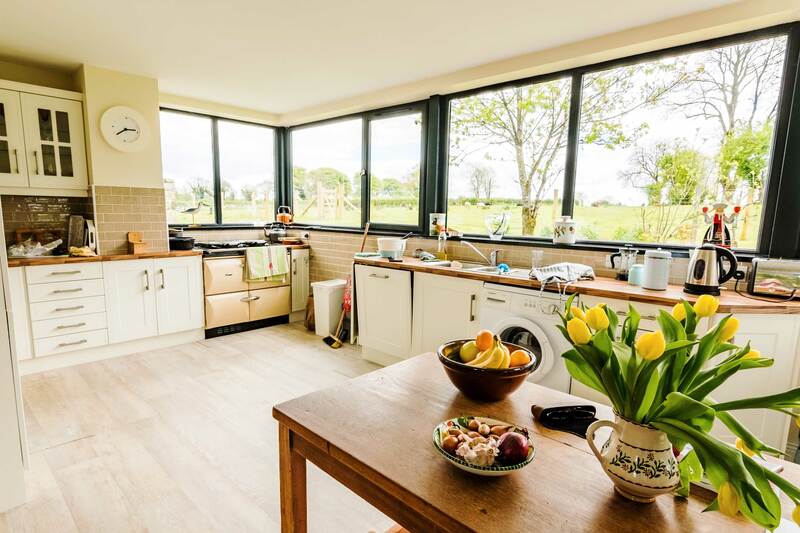 The two extensions to this 1980's beautifully designed and built cottage in County Clare includes a traditional front and highly glazed contemporary rear. 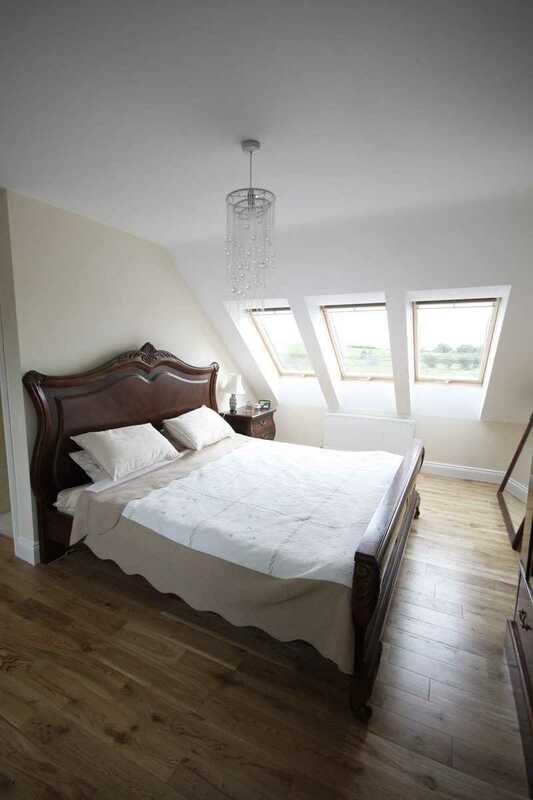 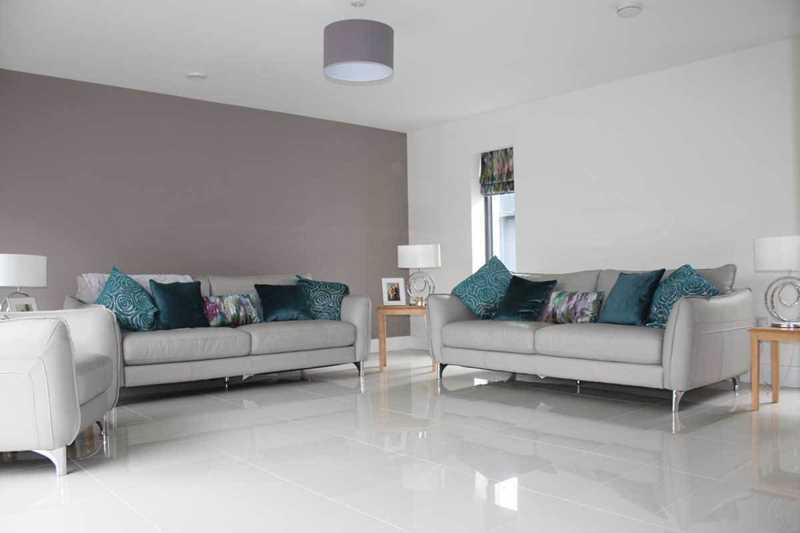 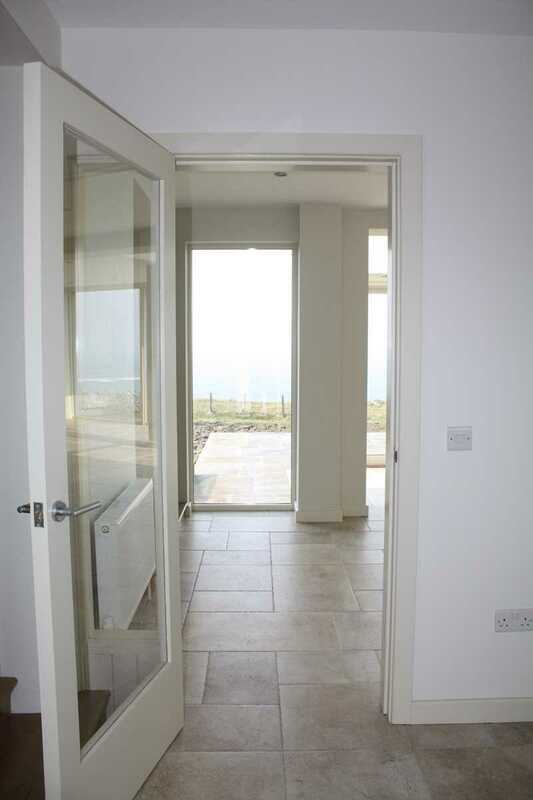 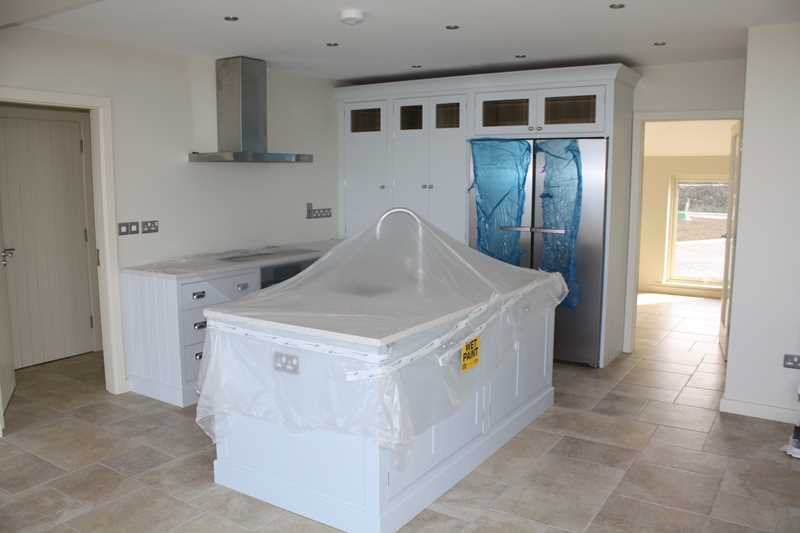 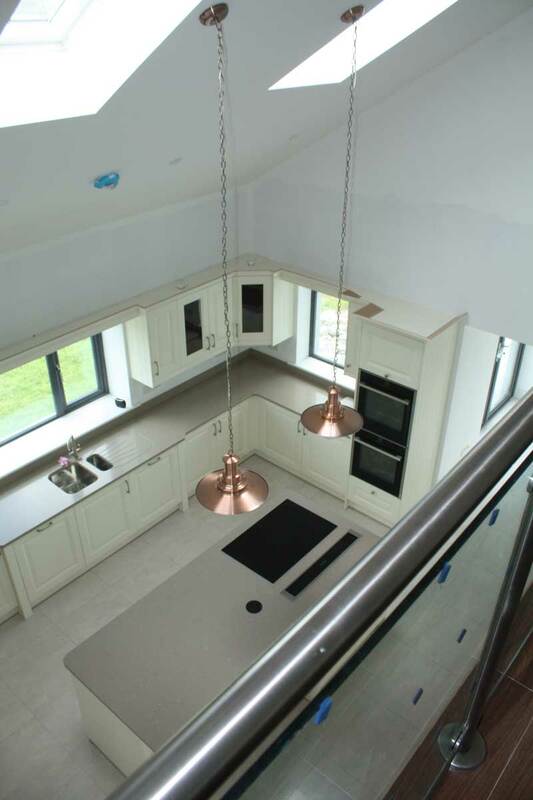 The extensions include new kitchens, dining area, bedrooms and TV rooms. 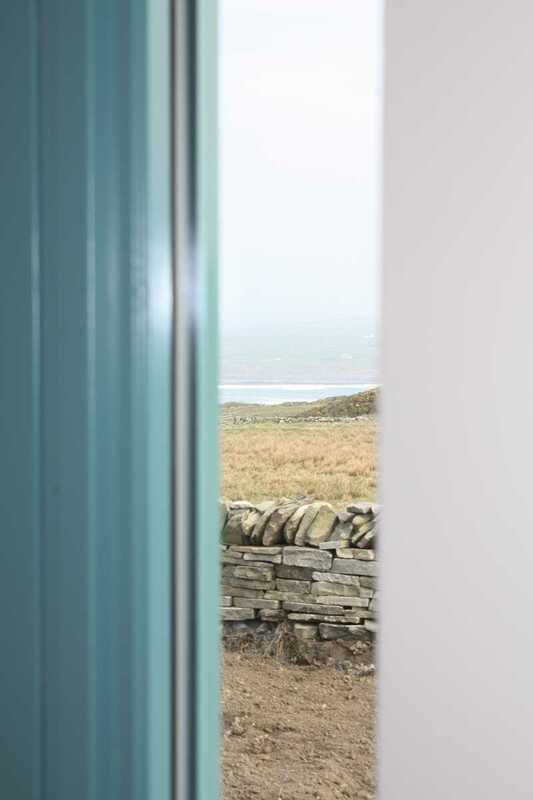 Click on the 'View More' button below to open the 'Tear Sheet' on this project. 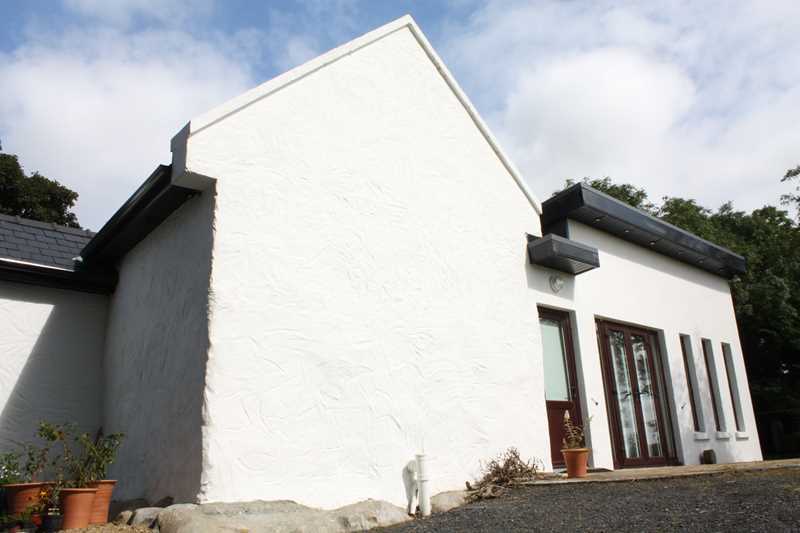 This curved wall, contemporary extension adds a new kitchen and living area plus bedroom and bathroom to a traditional County Mayo Irish Cottage. 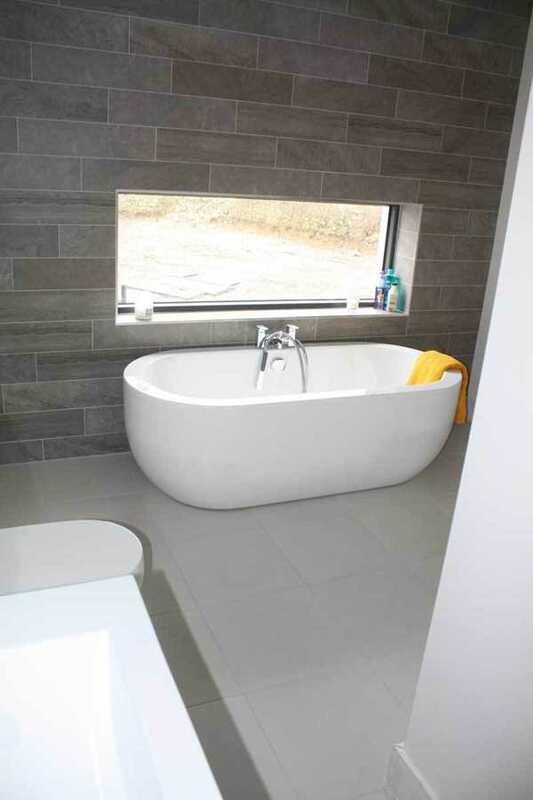 Click on the 'View More' button below to open the 'Tear Sheet' on this project. 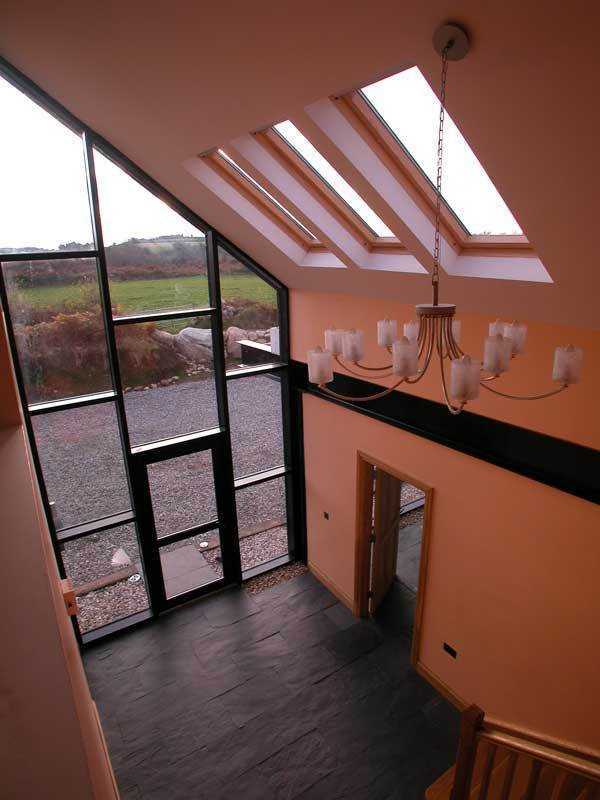 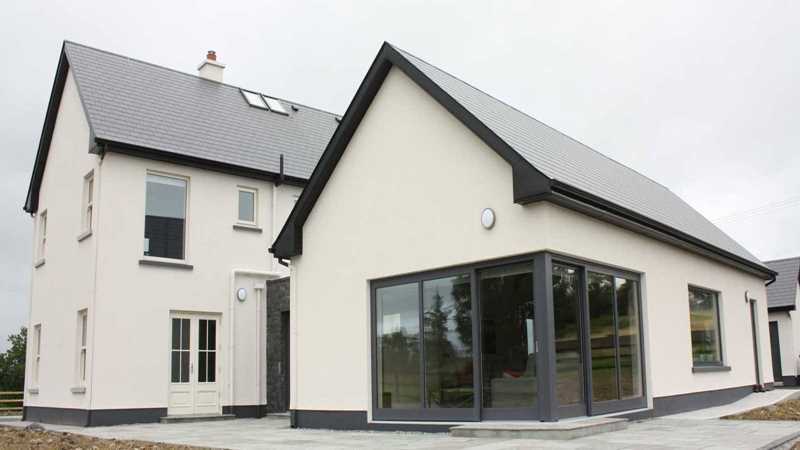 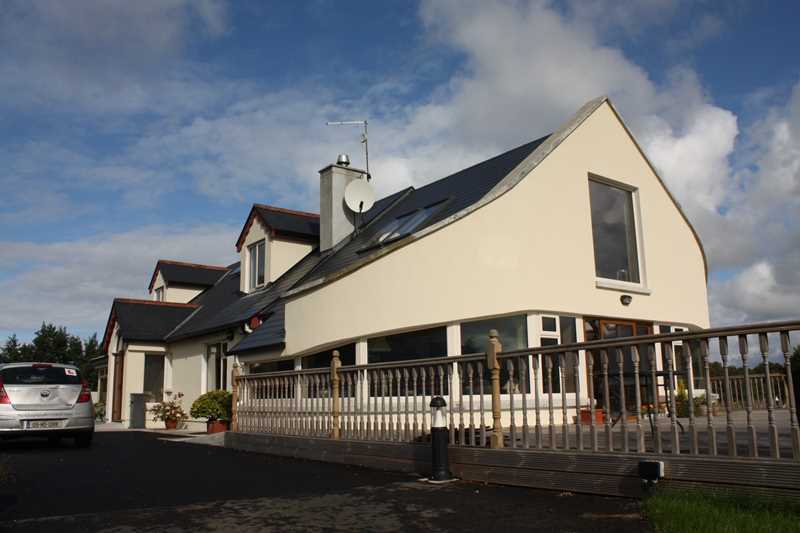 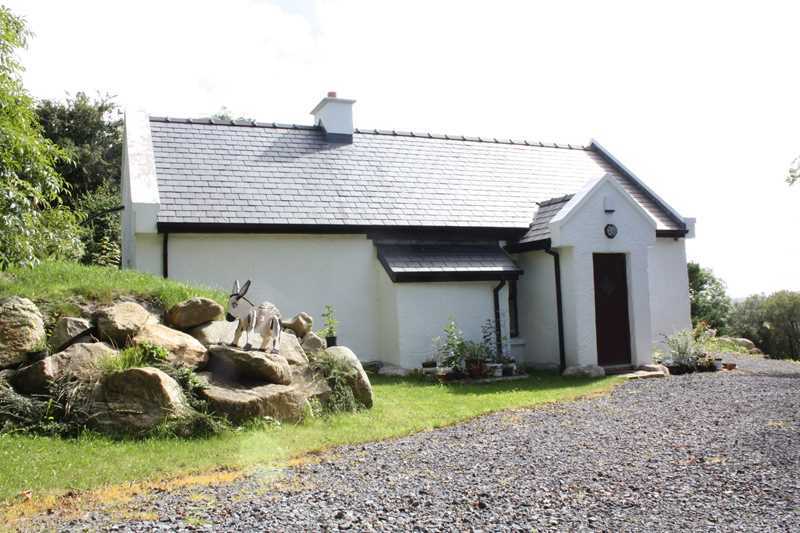 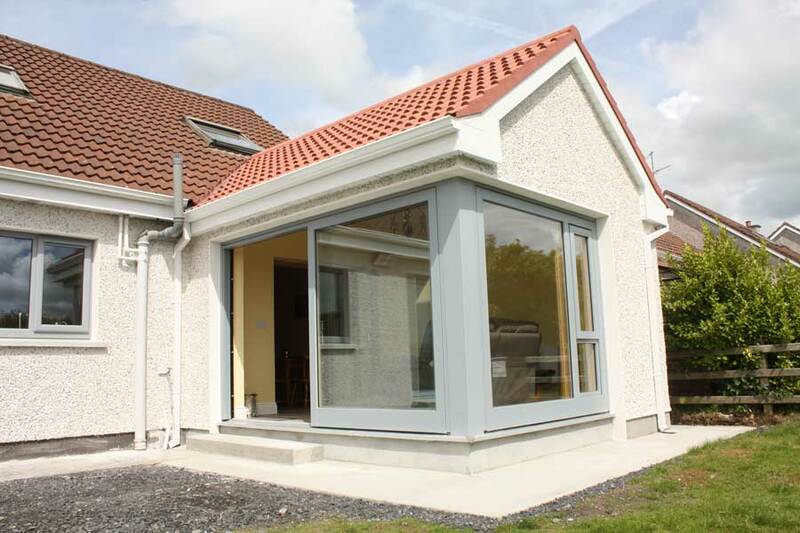 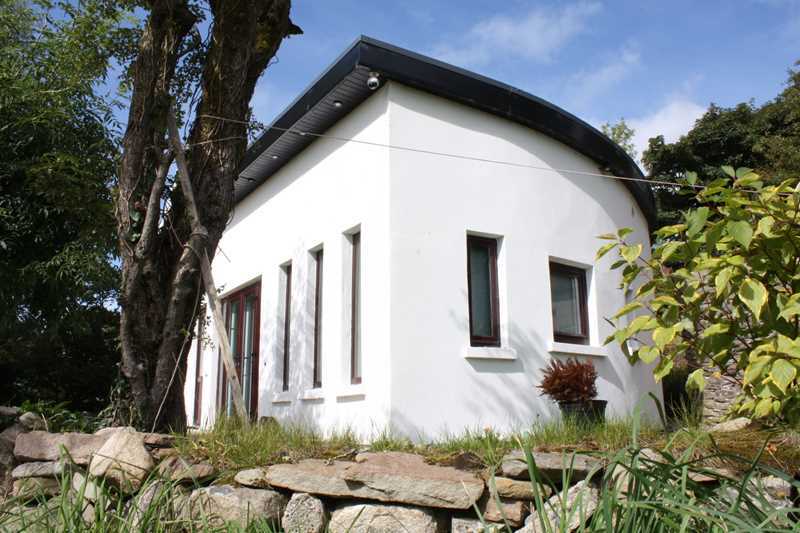 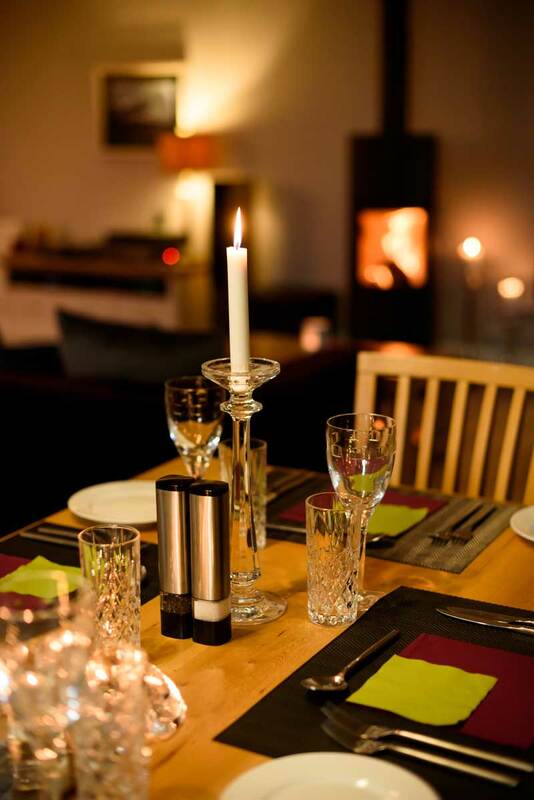 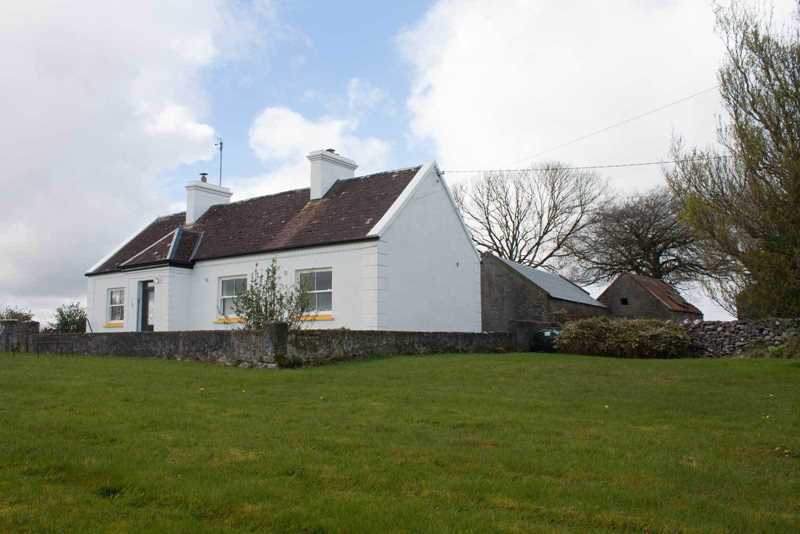 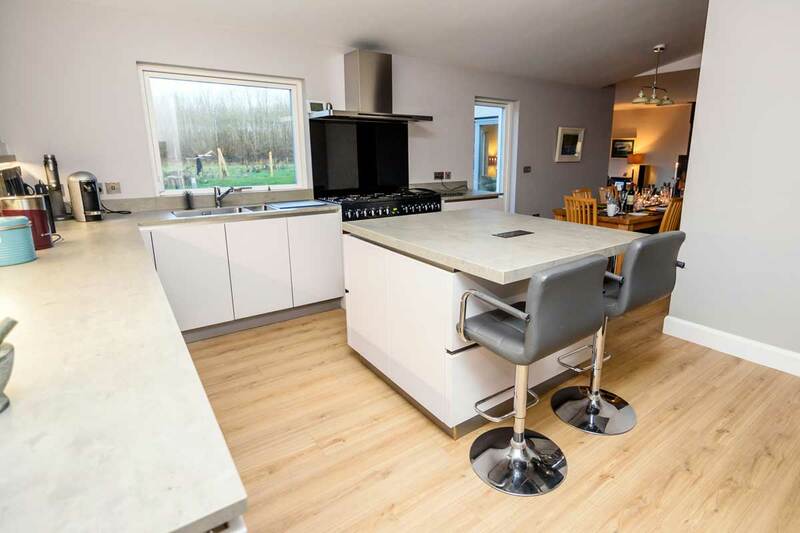 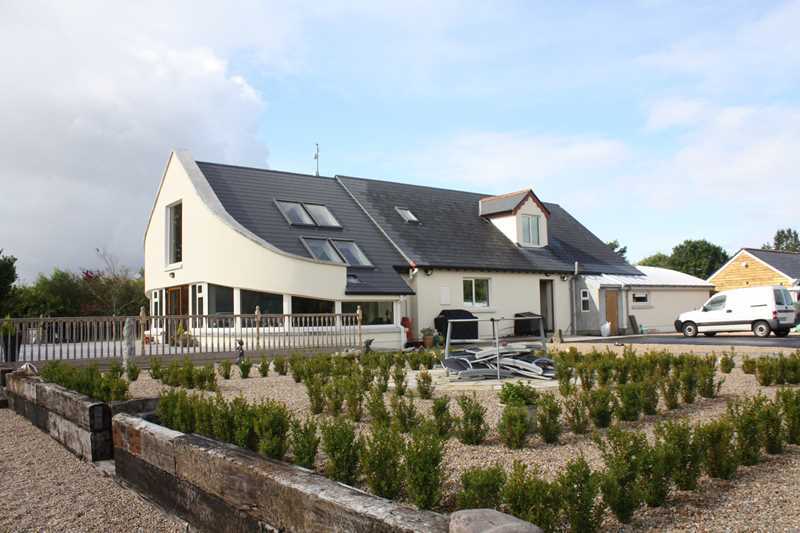 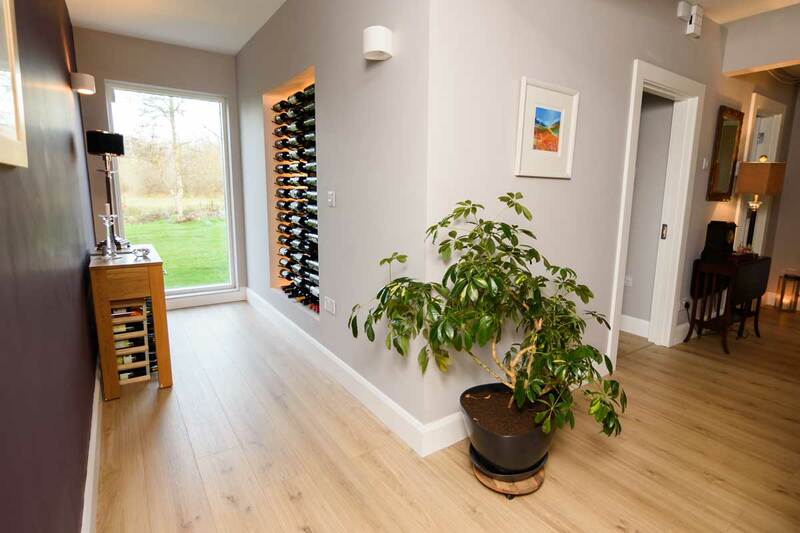 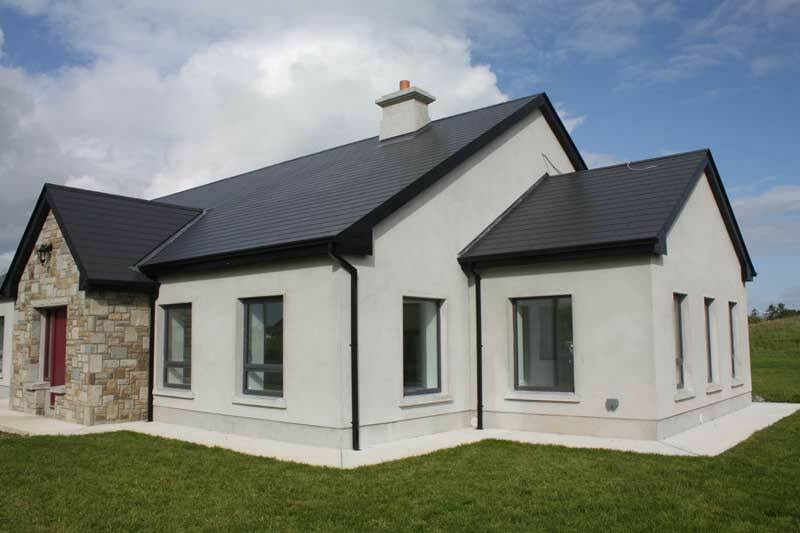 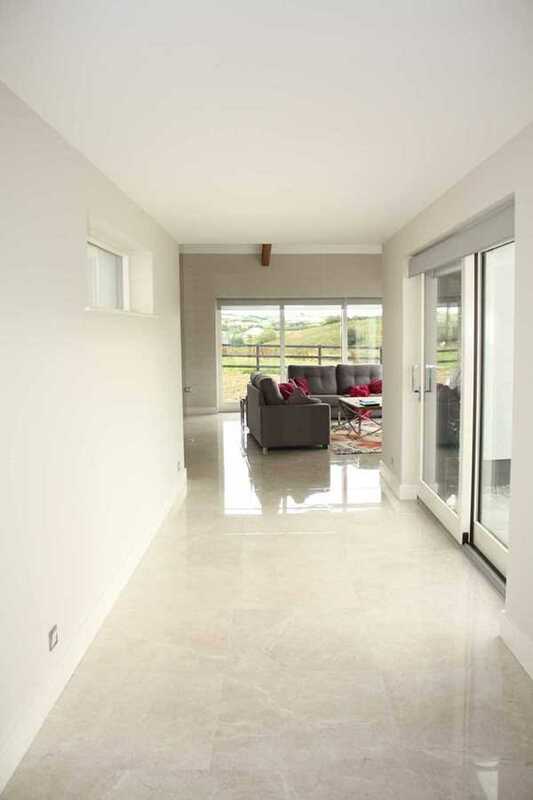 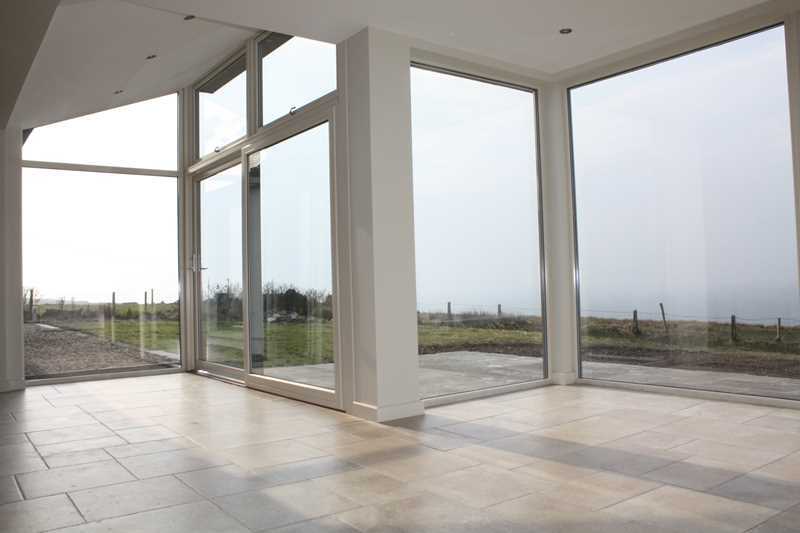 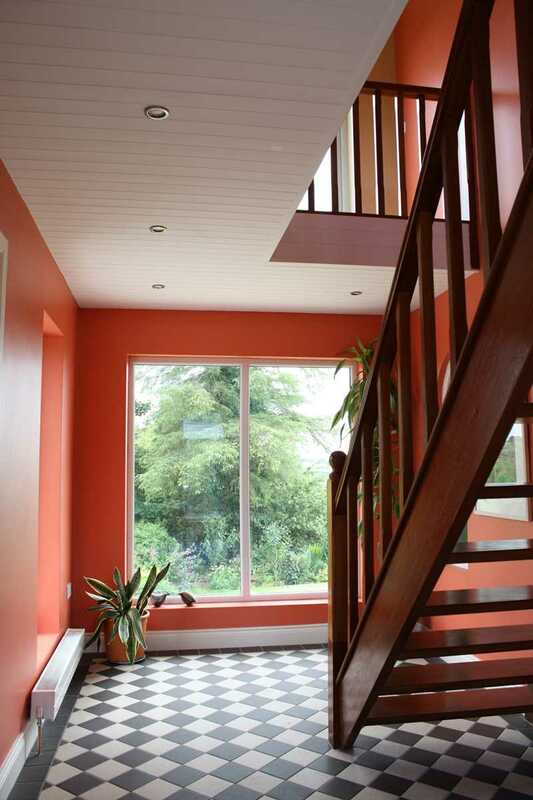 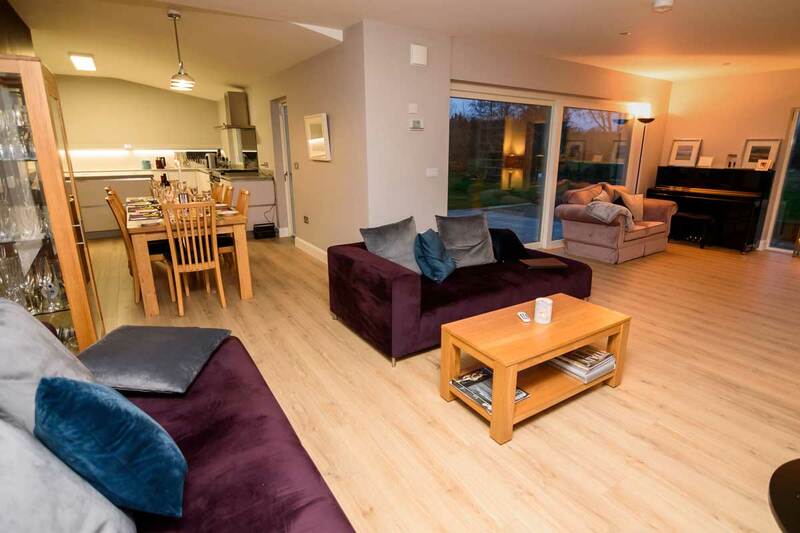 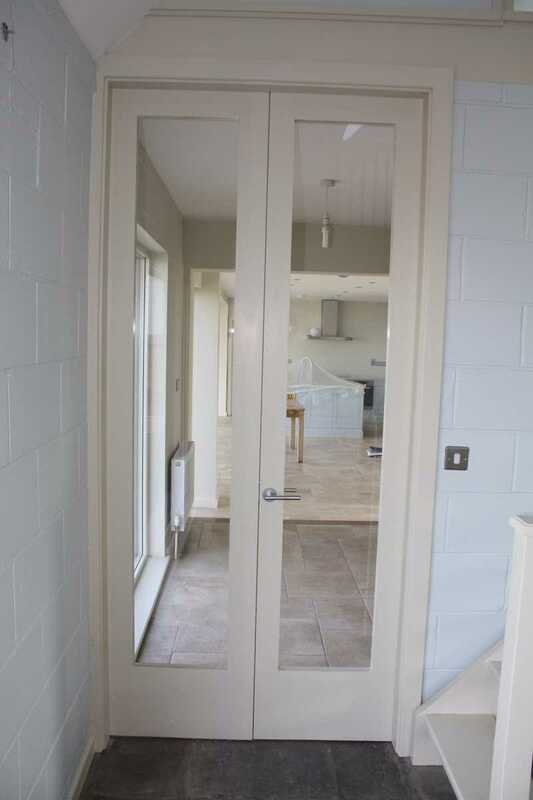 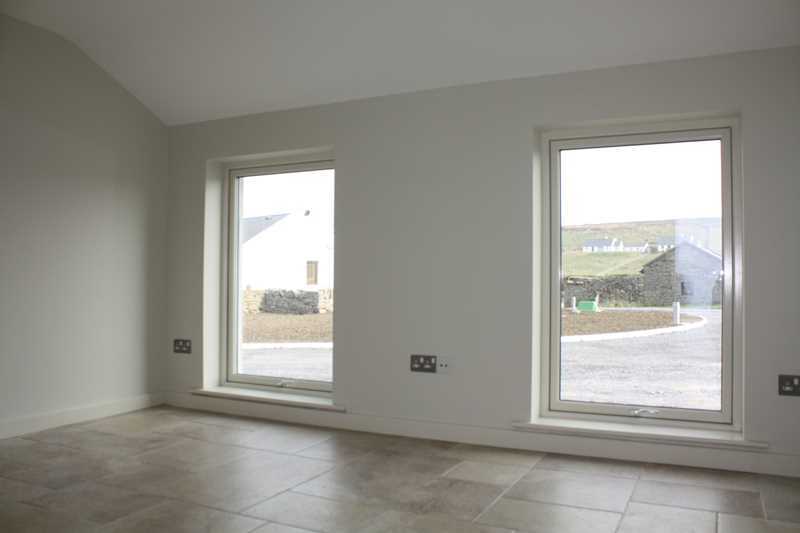 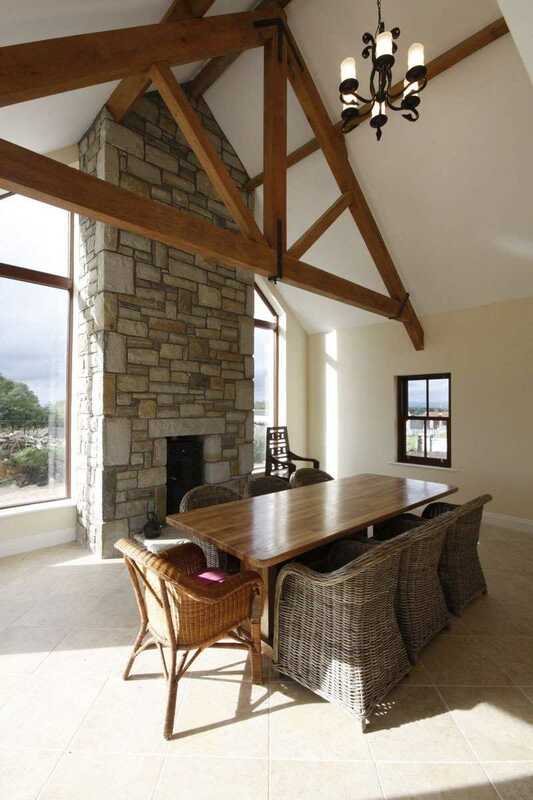 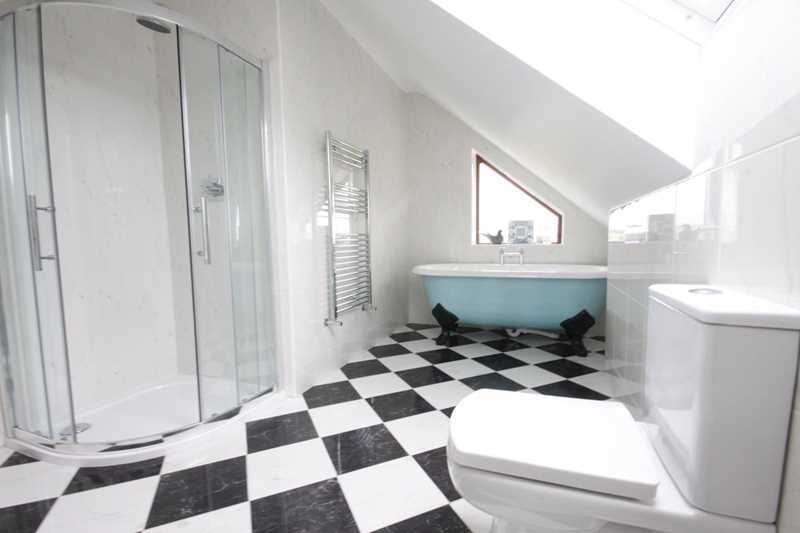 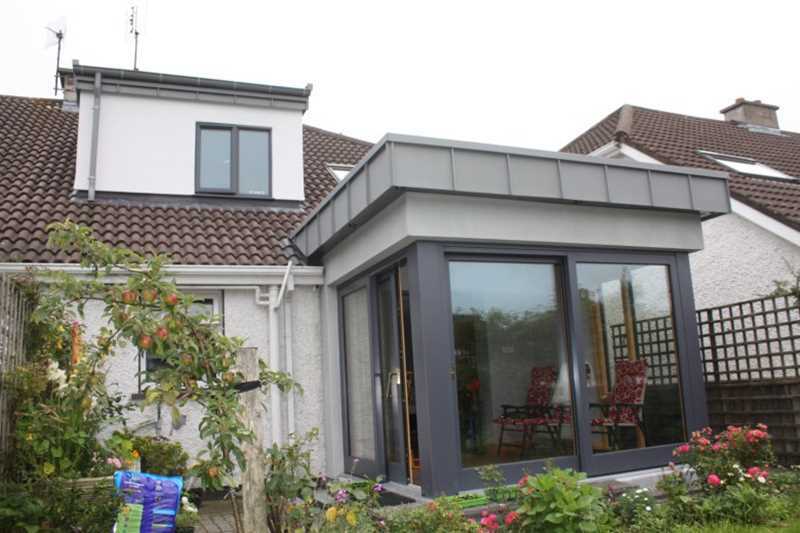 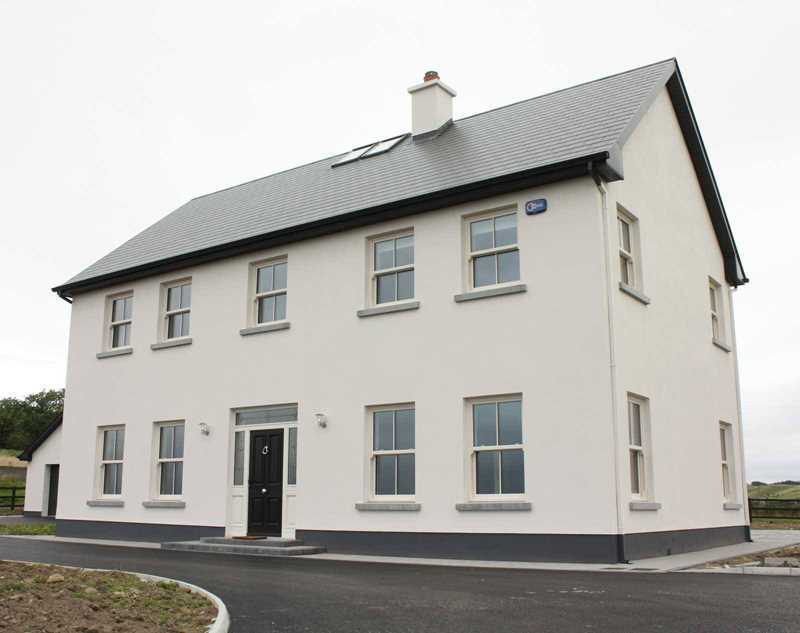 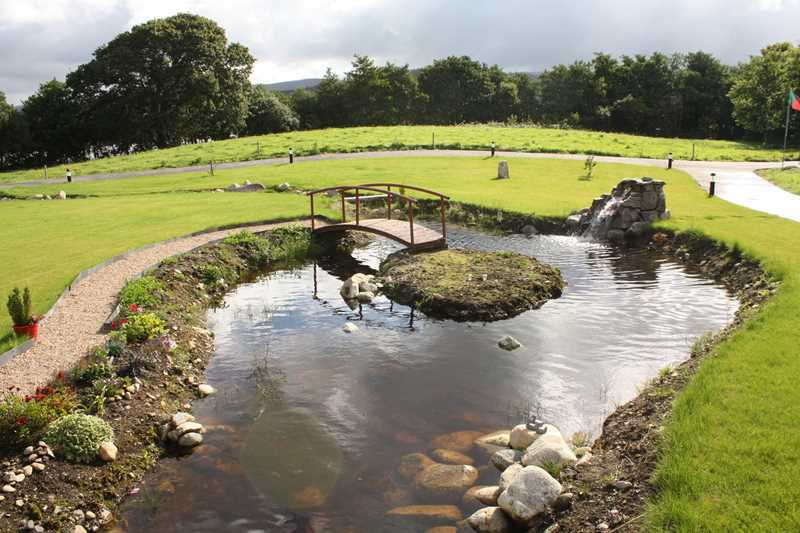 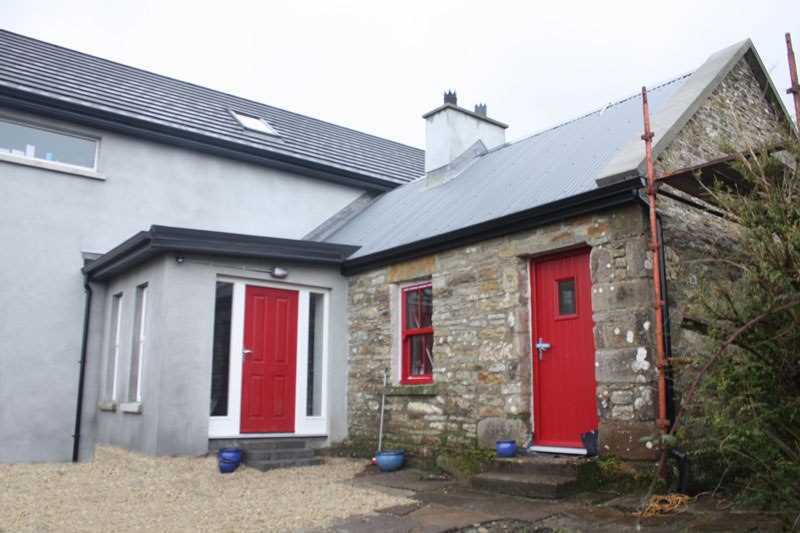 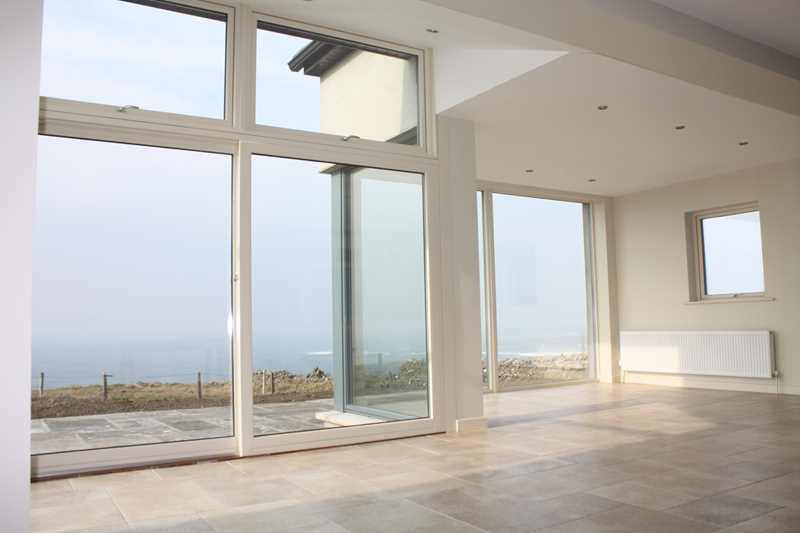 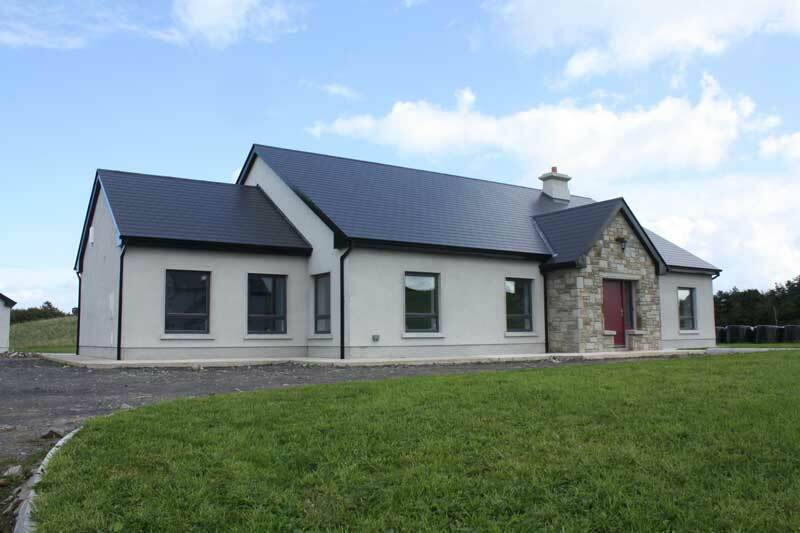 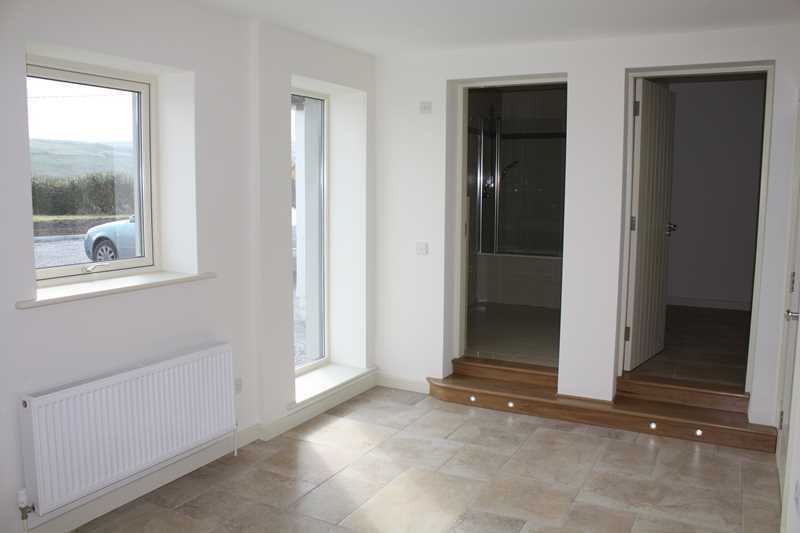 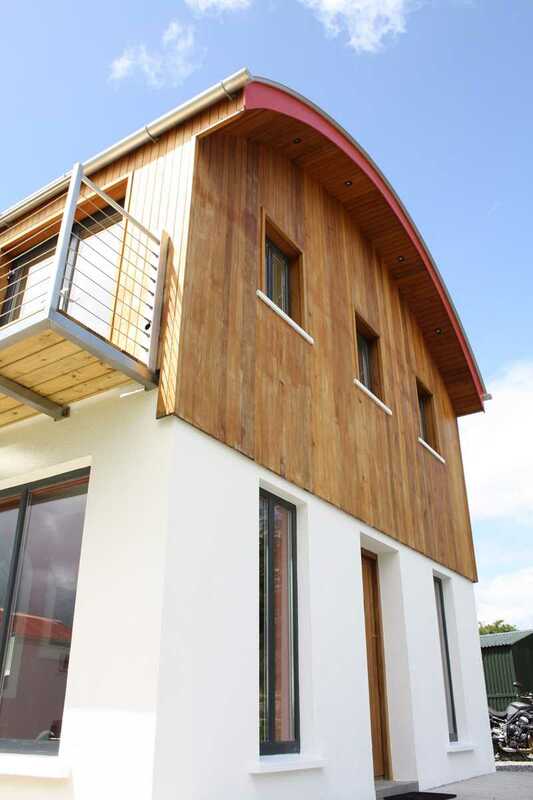 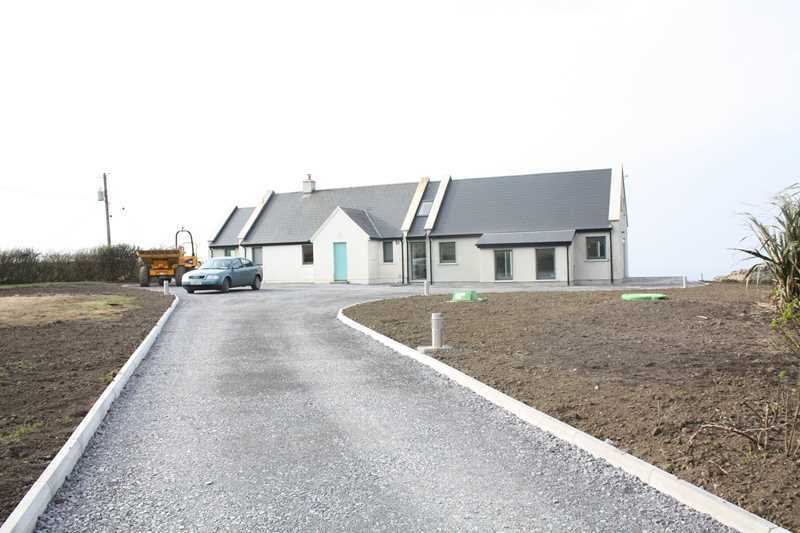 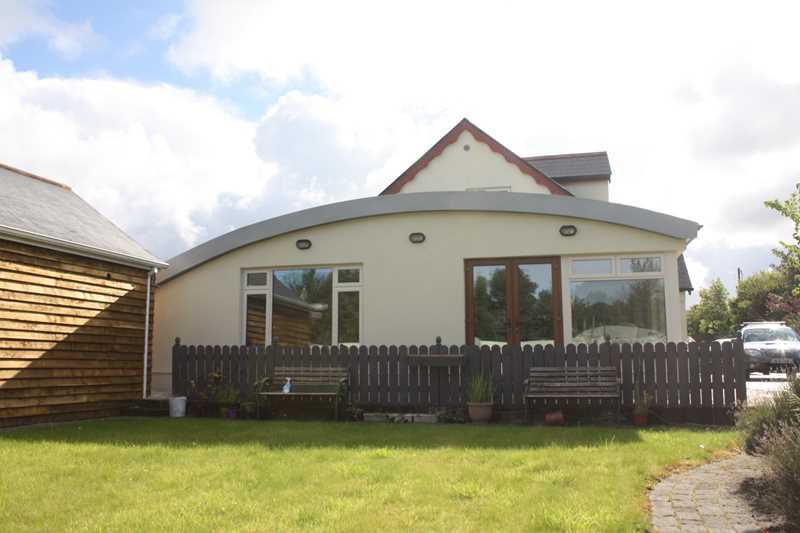 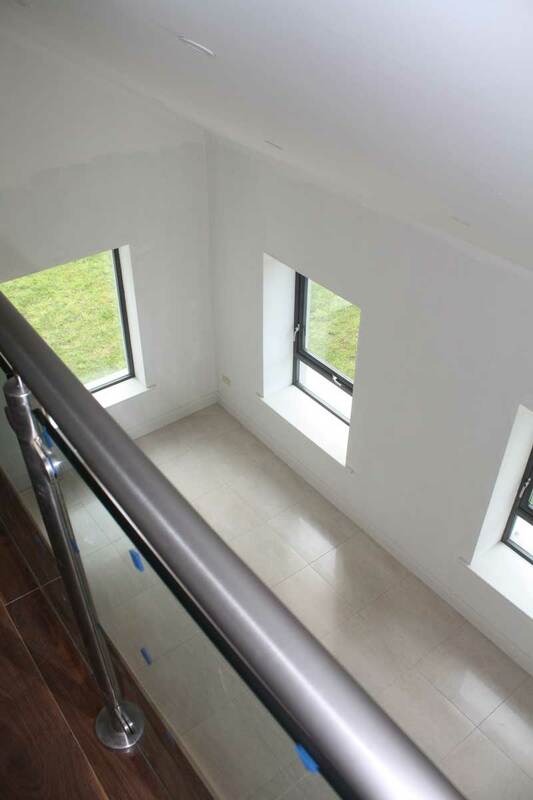 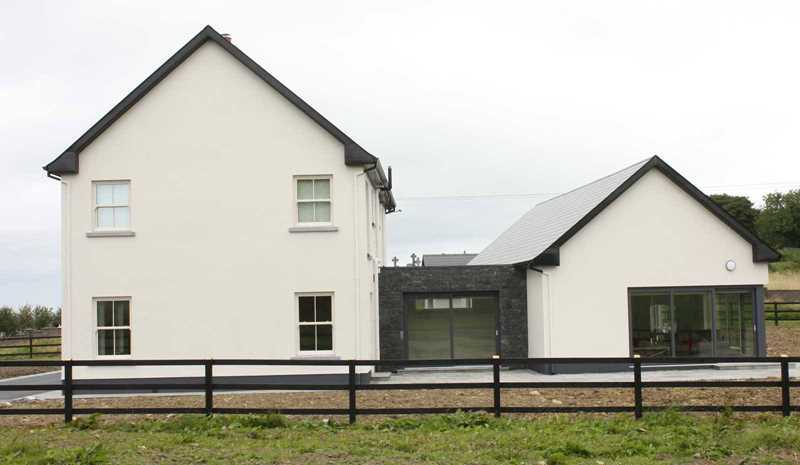 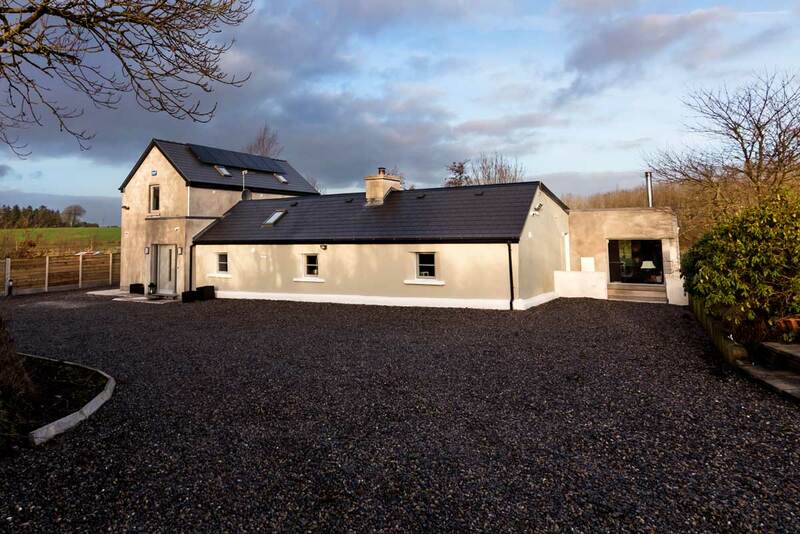 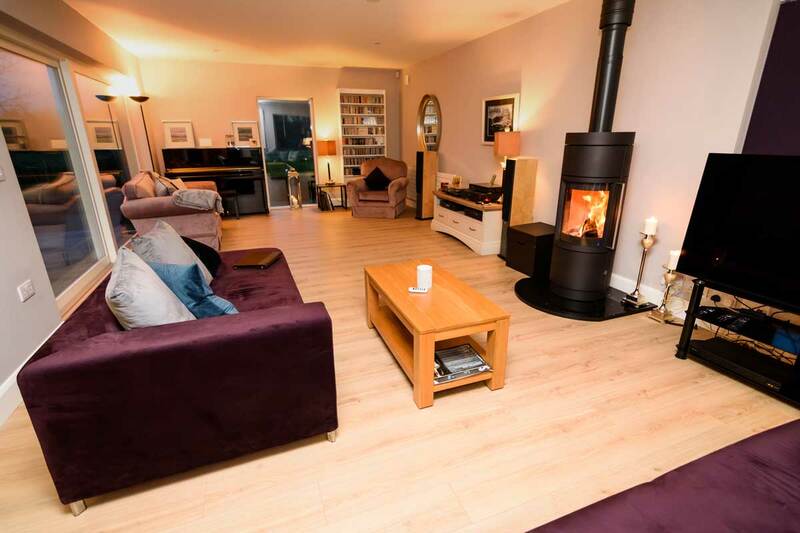 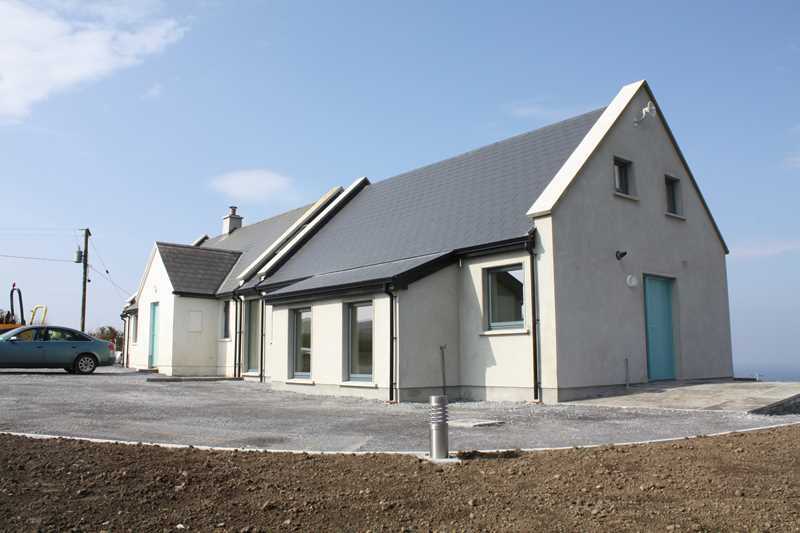 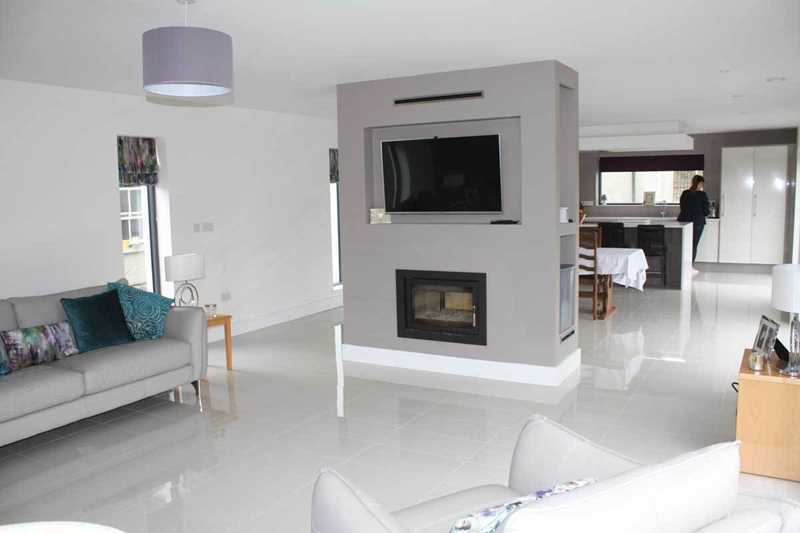 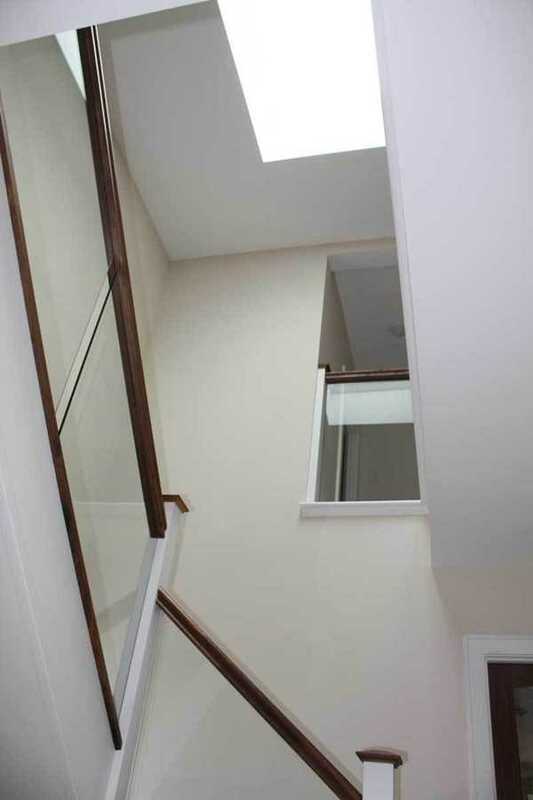 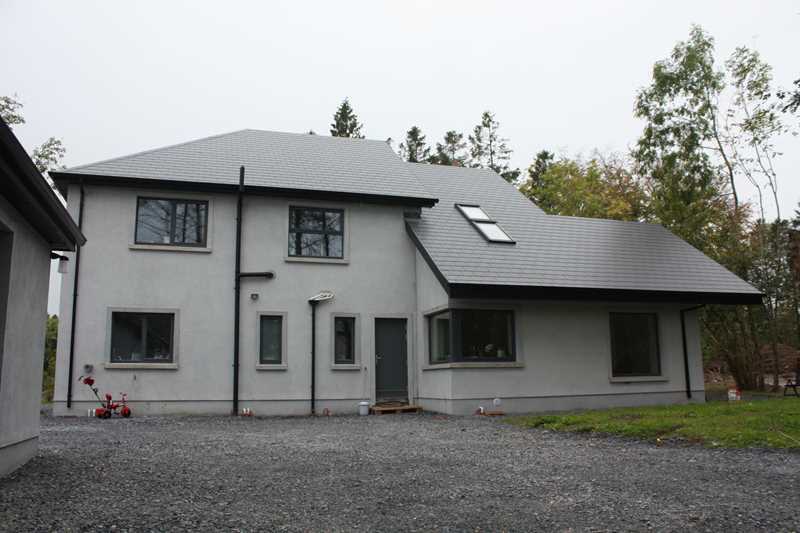 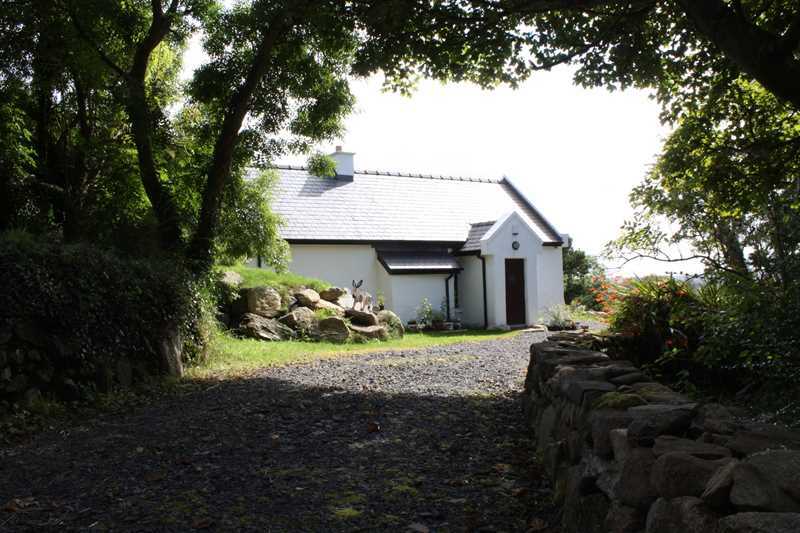 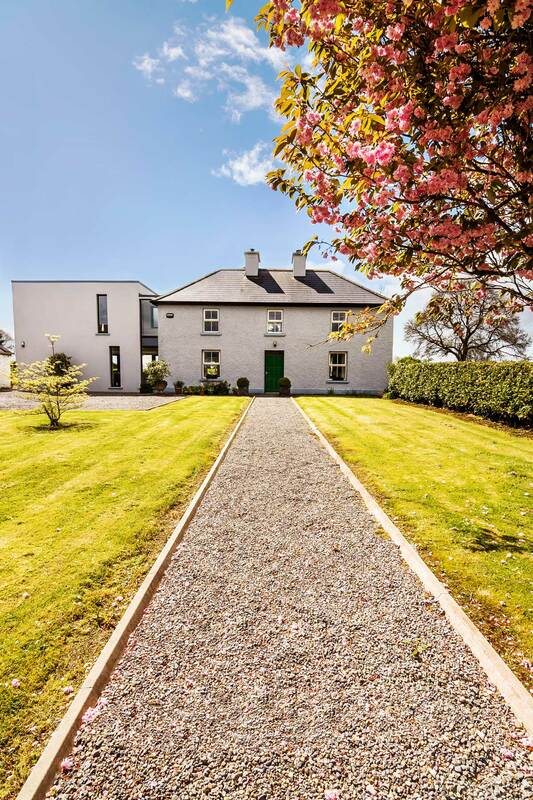 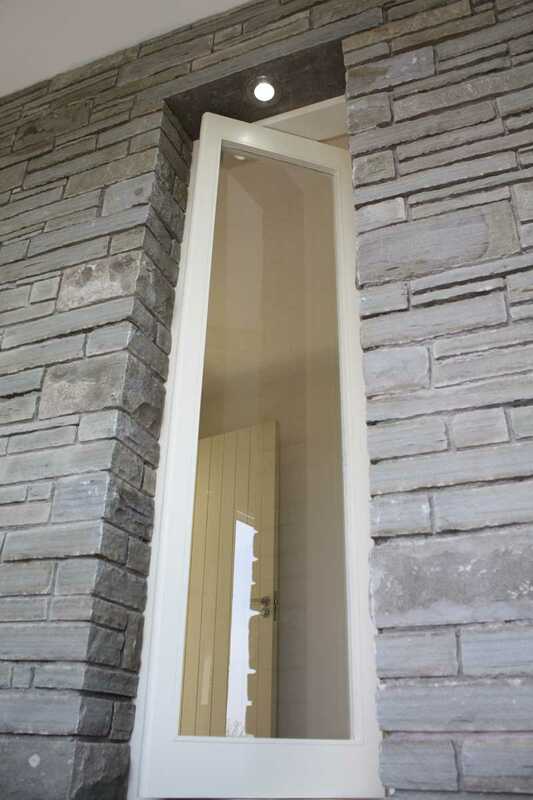 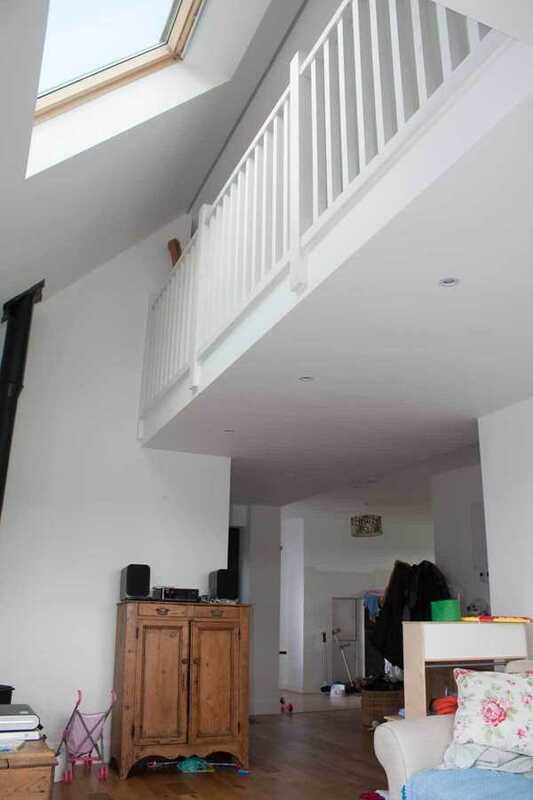 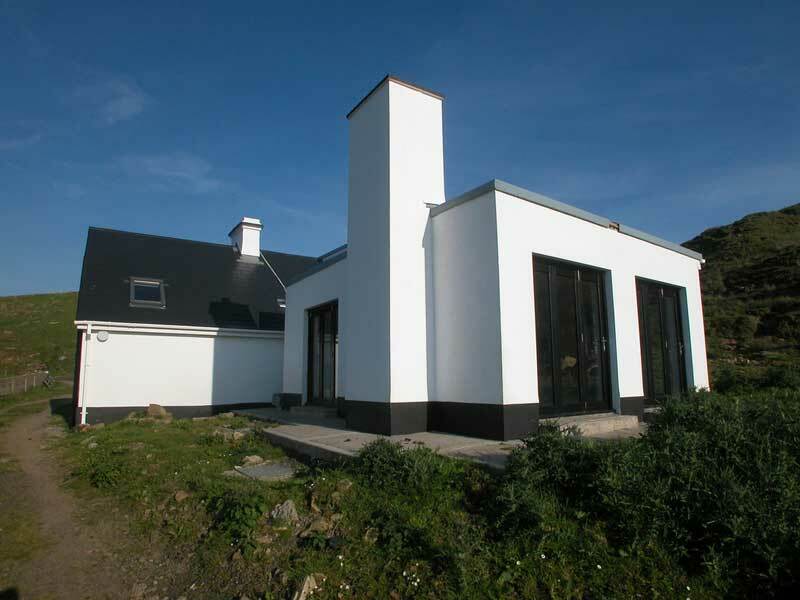 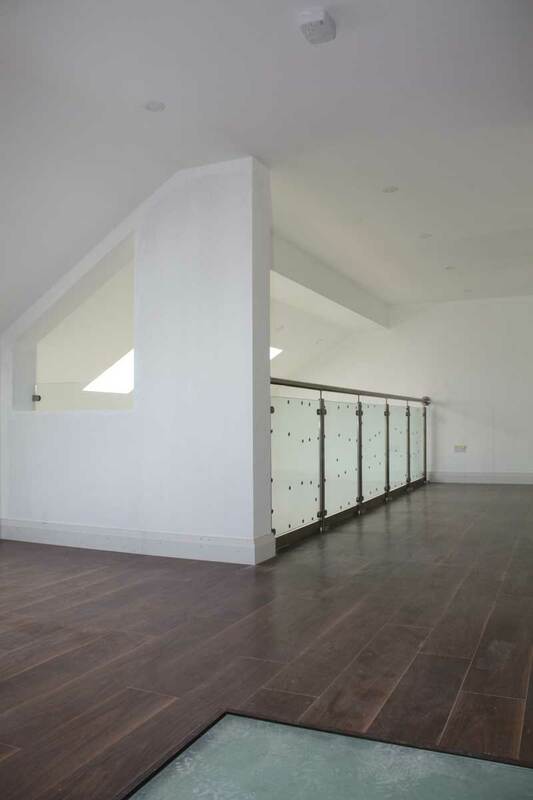 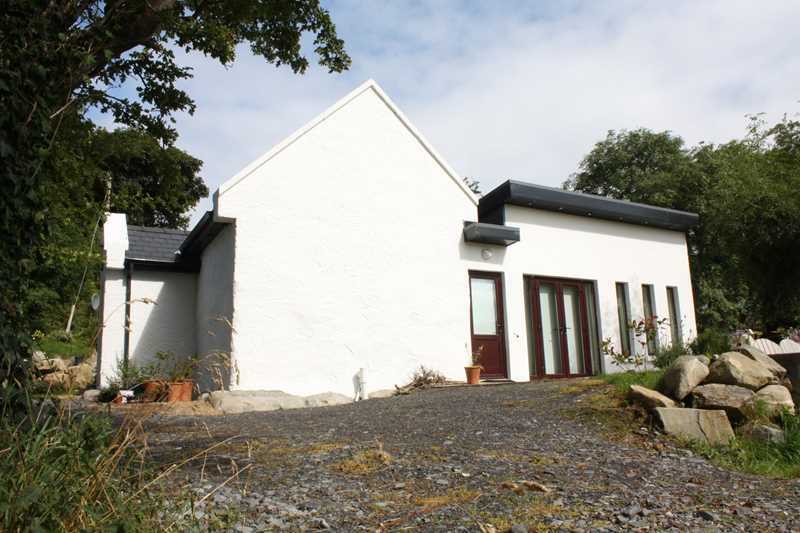 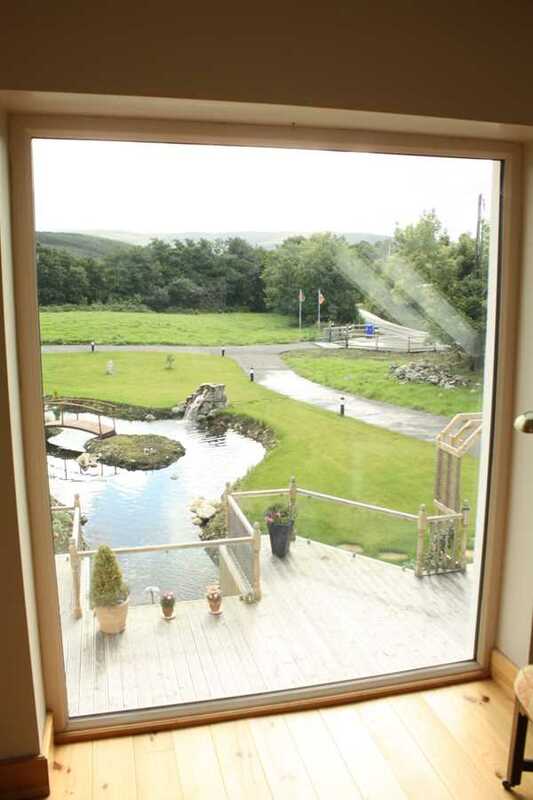 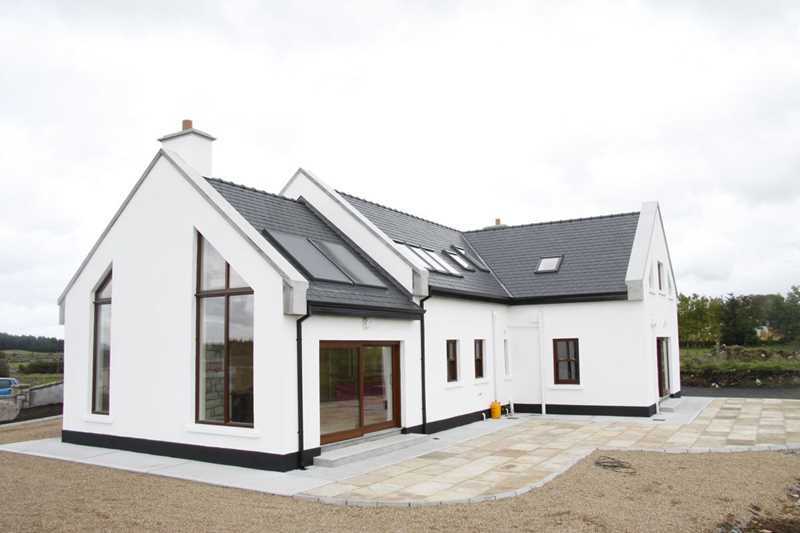 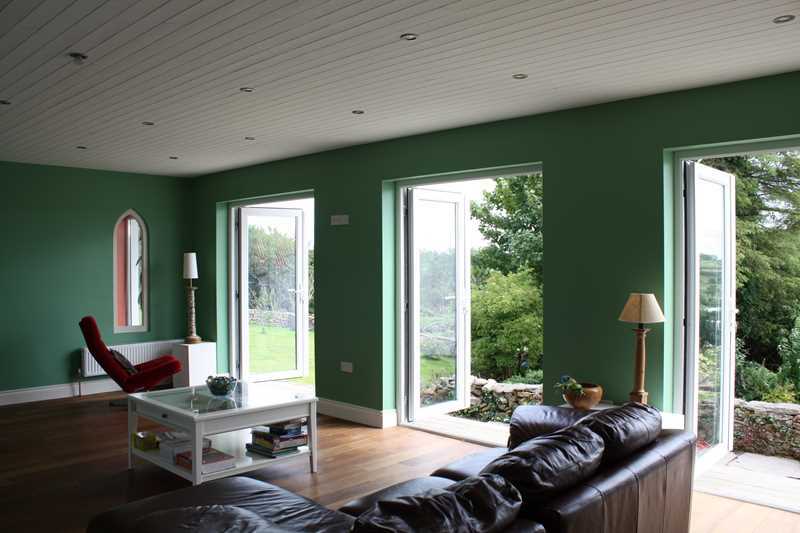 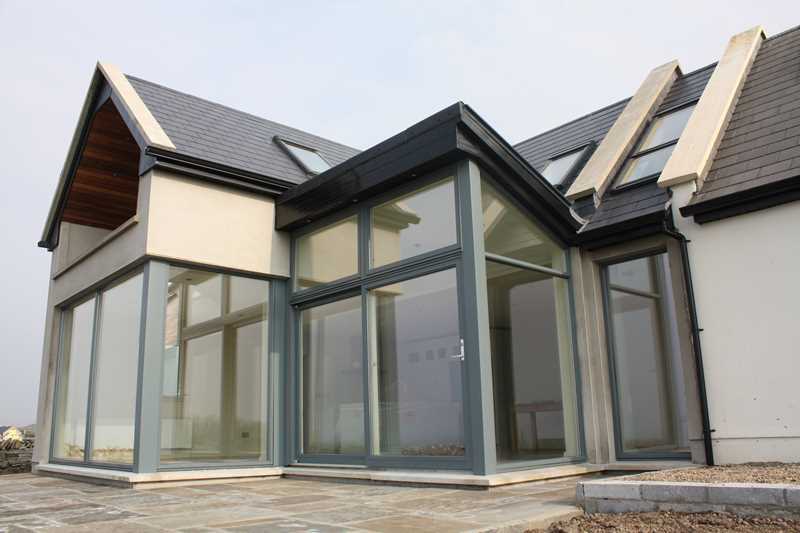 A new detached house with contemporary features in a gated estate in County Galway. 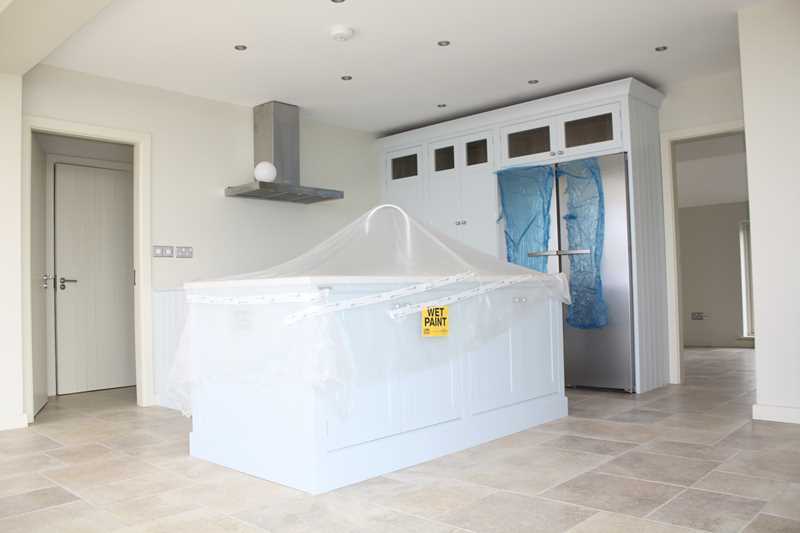 Click on the 'View More' button below to open the 'Tear Sheet' on this project. 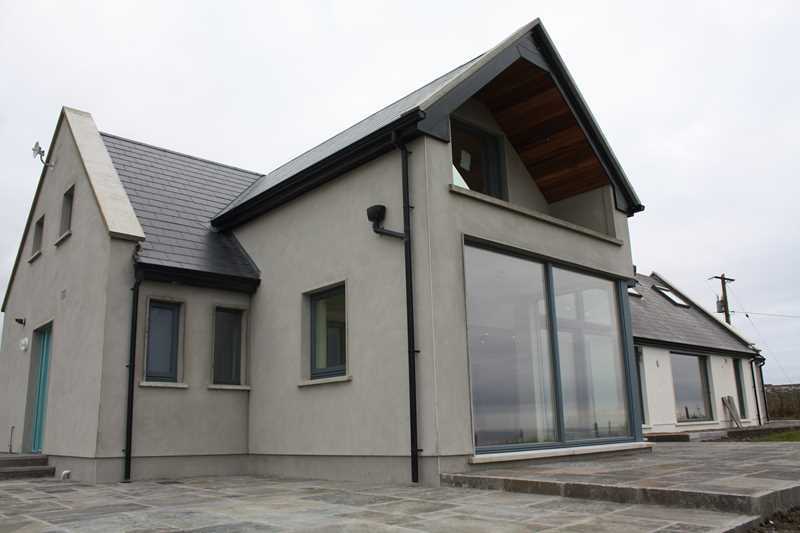 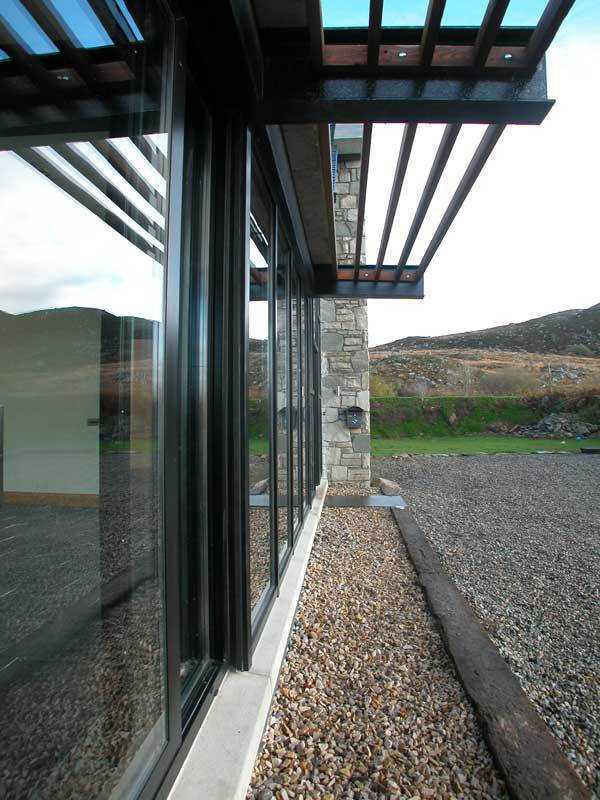 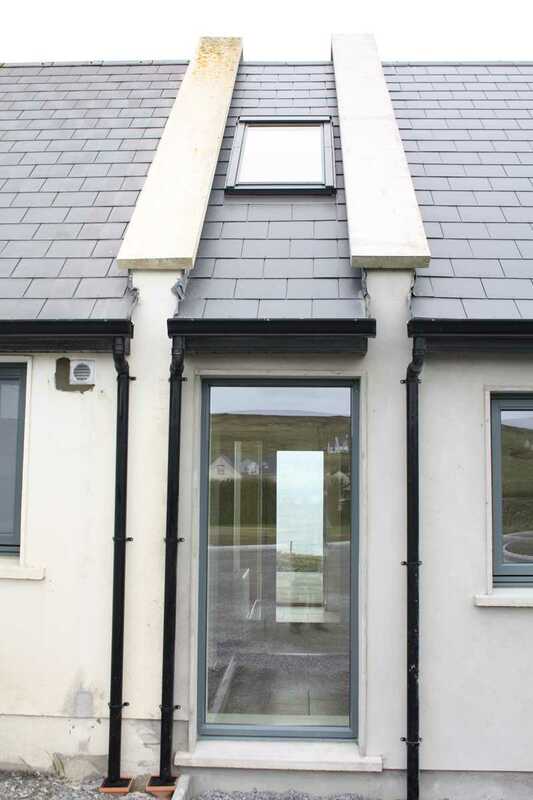 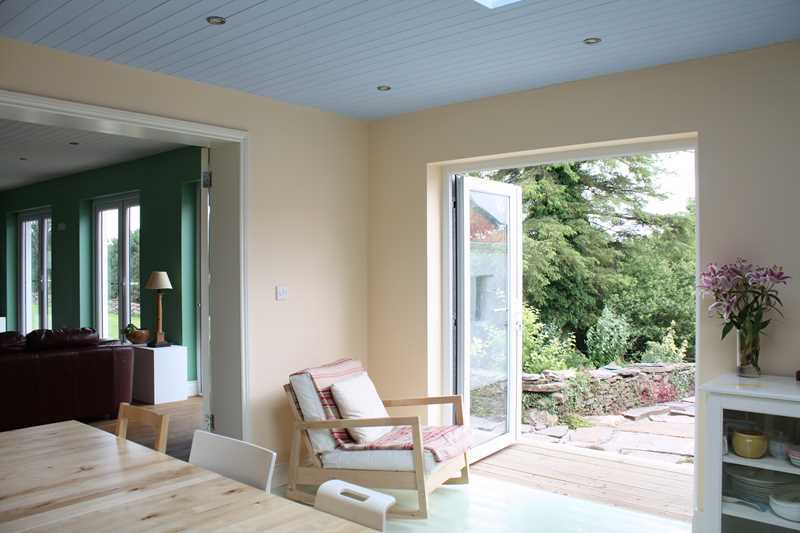 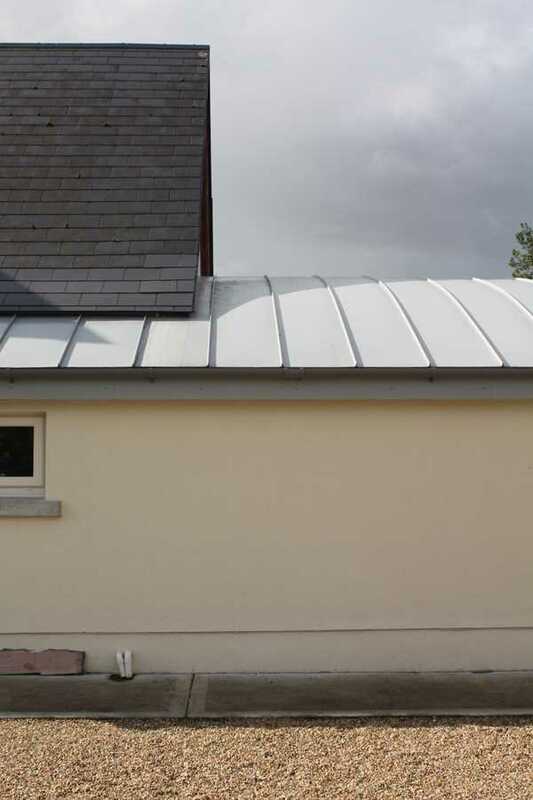 We have created two extensions and either end of this traditional dormer bungalow in County Mayo. 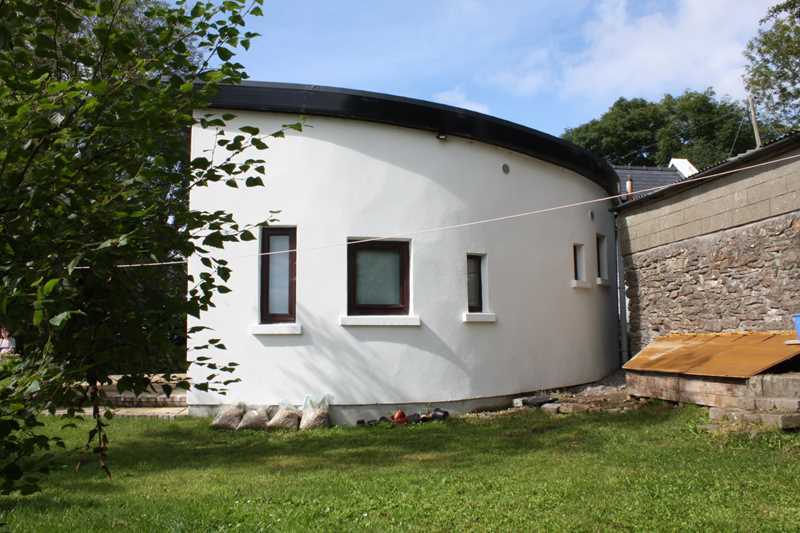 At one end the walls are curved; at the other the roof is curved. 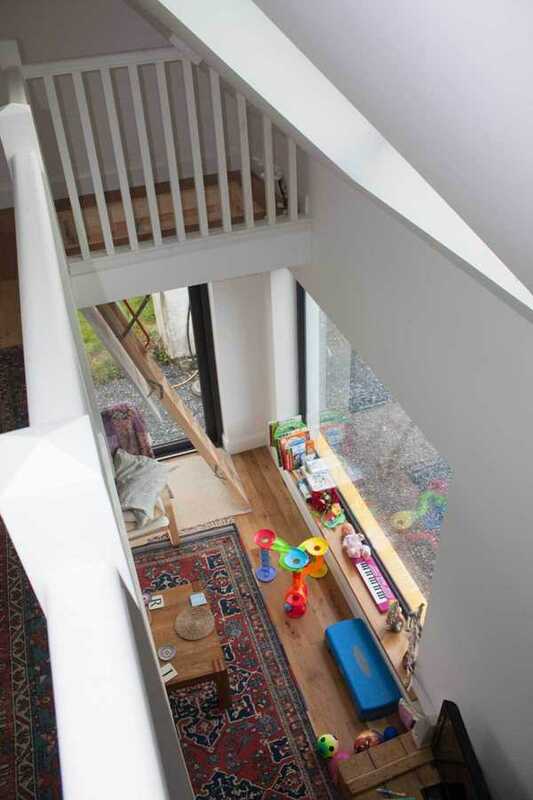 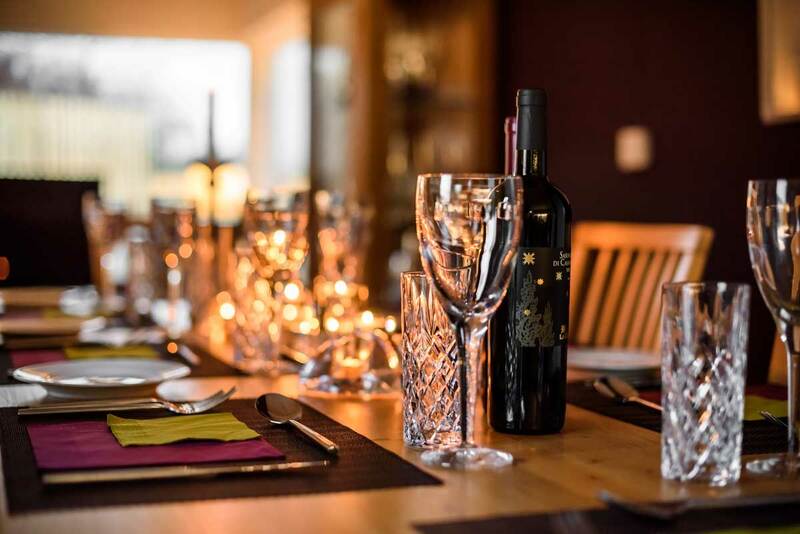 The house has been transformed from the ordinary to the incredible. 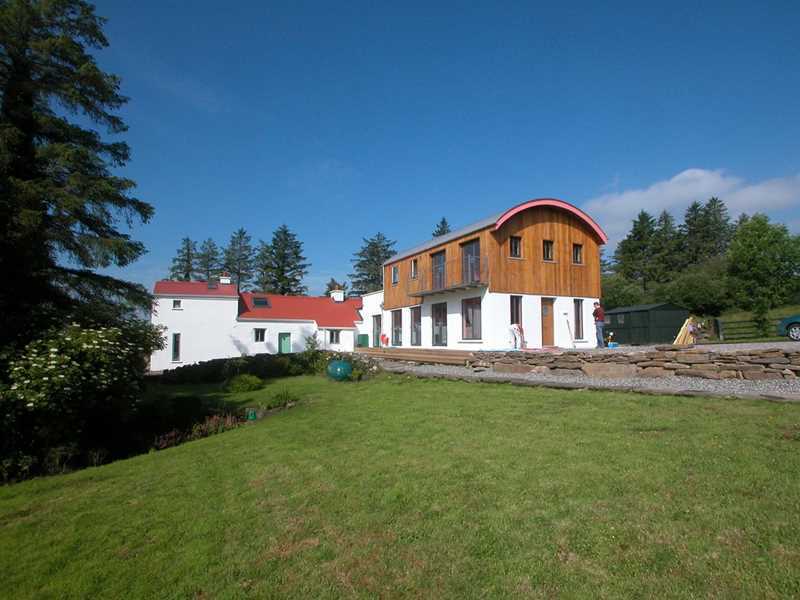 Click on the 'View More' button below to open the 'Tear Sheet' on this project. 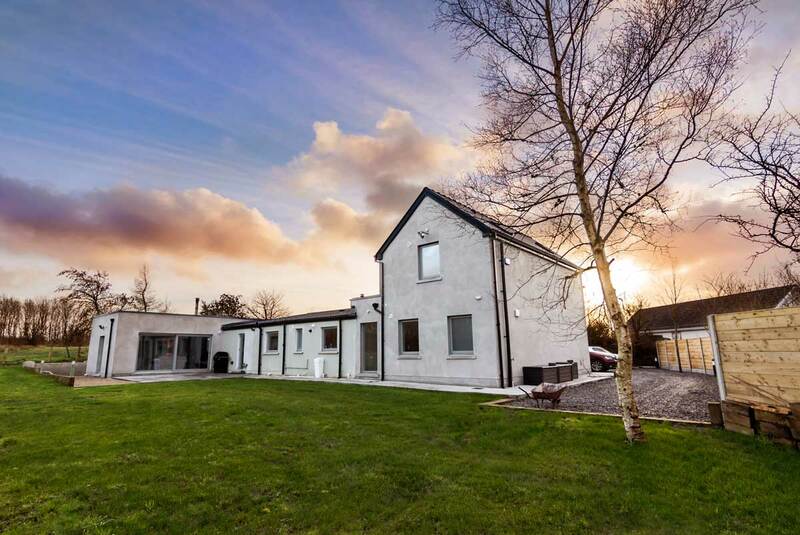 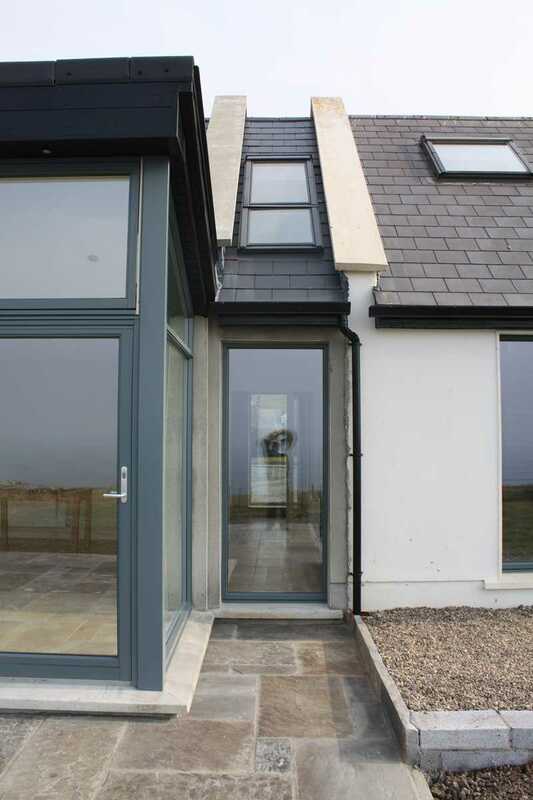 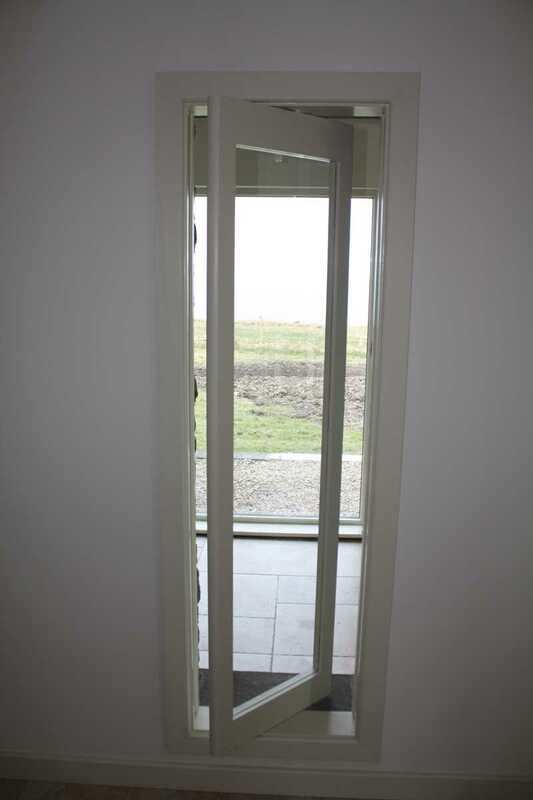 This new house in County Mayo includes a two storey traditional house to the front connected with a contemporary glazed 'link' to a single storey 'pavilion' at the rear. 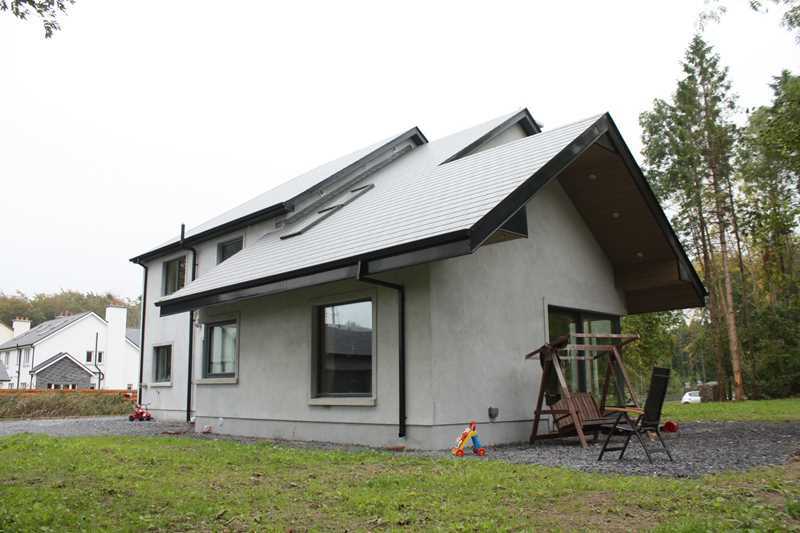 An A-rated house that includes triple-glazed windows, an MHVR system this new house is a combination of traditional and contemporary. 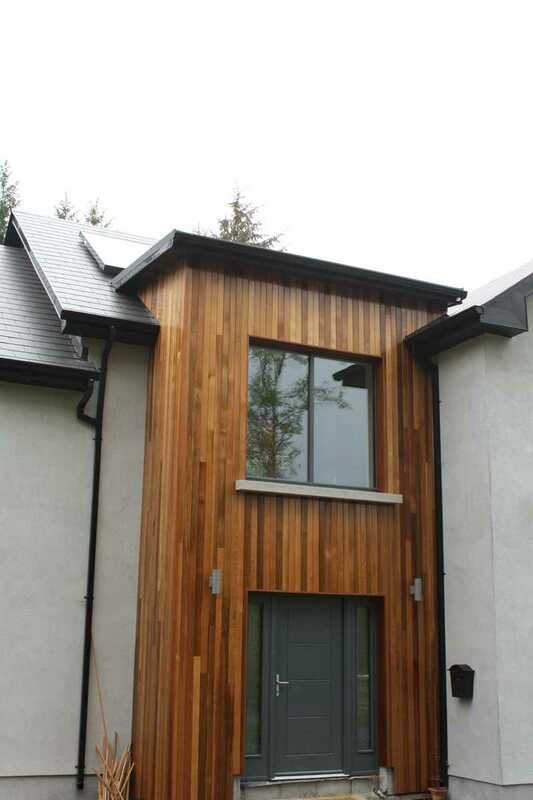 Click on the 'View More' button below to open the 'Tear Sheet' on this project. 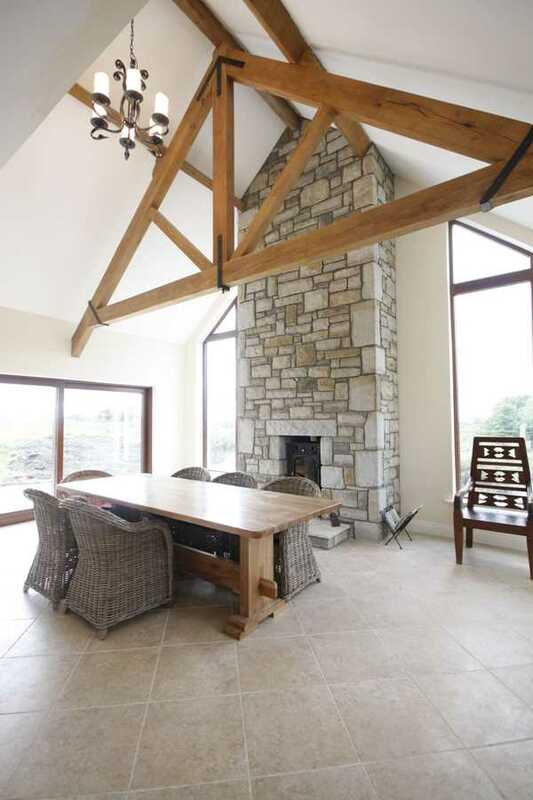 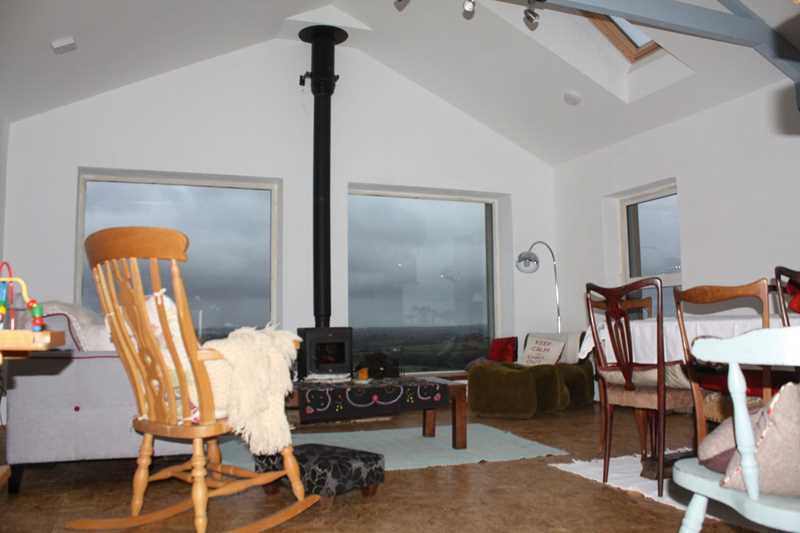 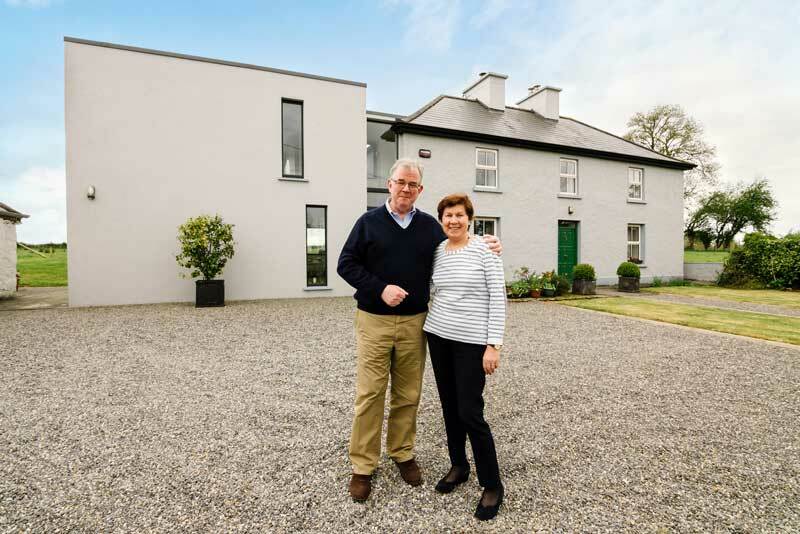 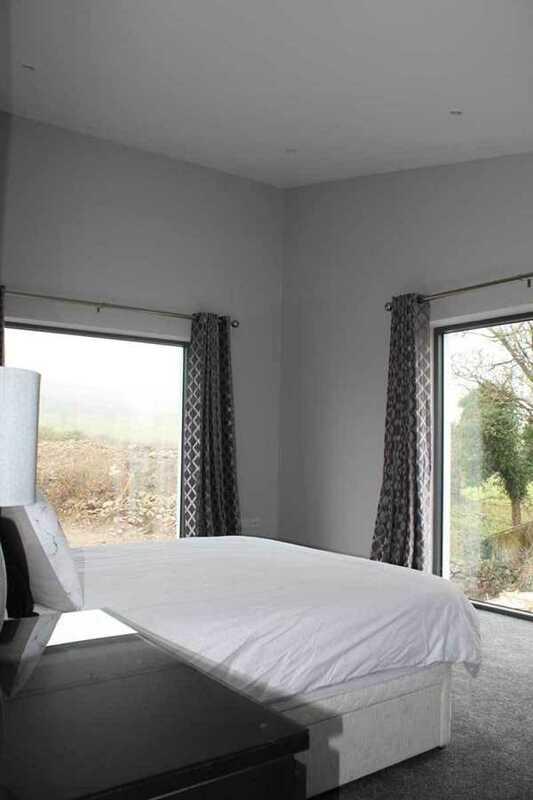 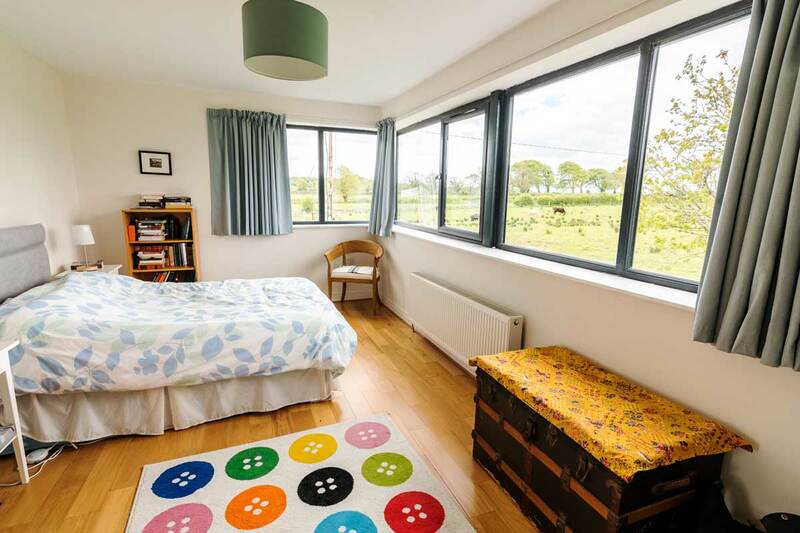 This extension and restoration to a traditional single storey County Mayo Irish cottage gives substantial new living and bedroom space for a family. 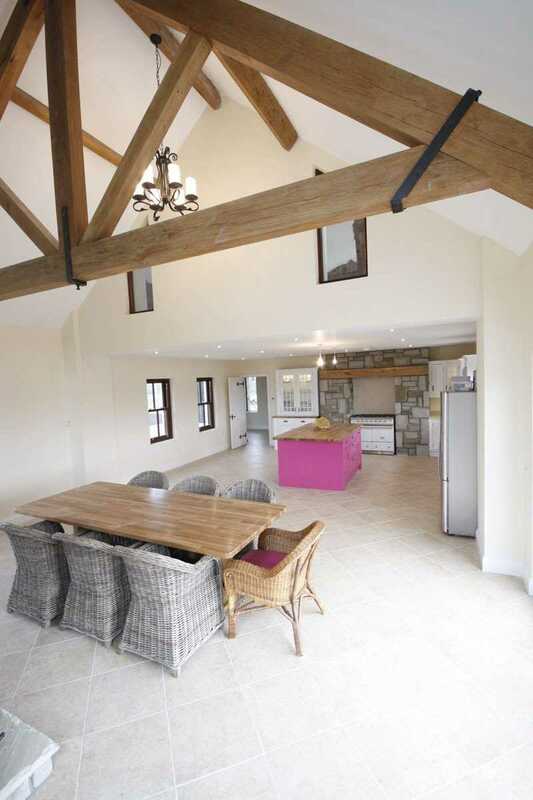 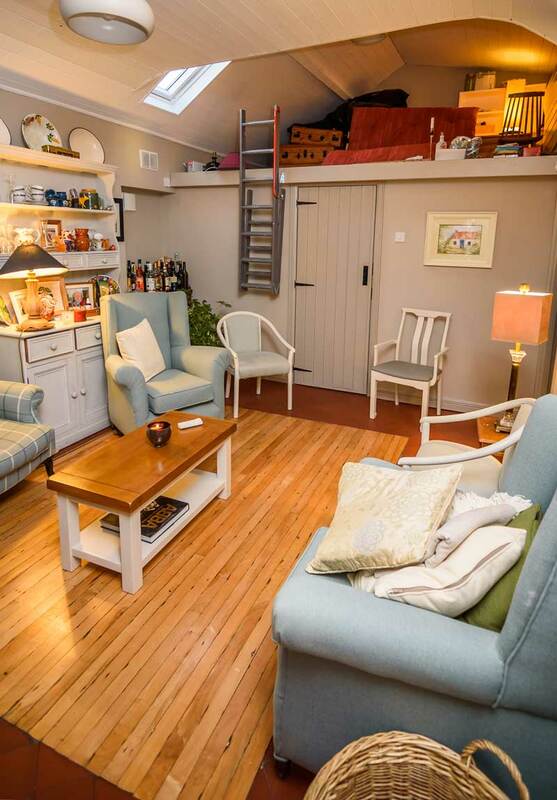 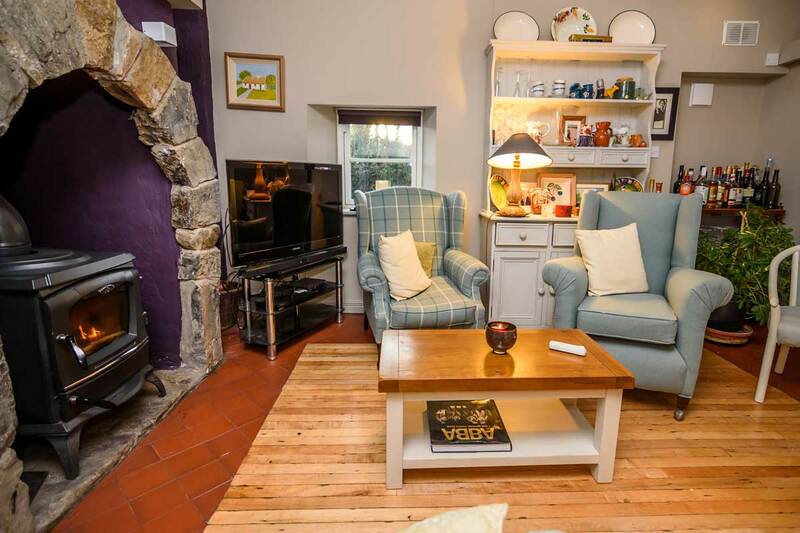 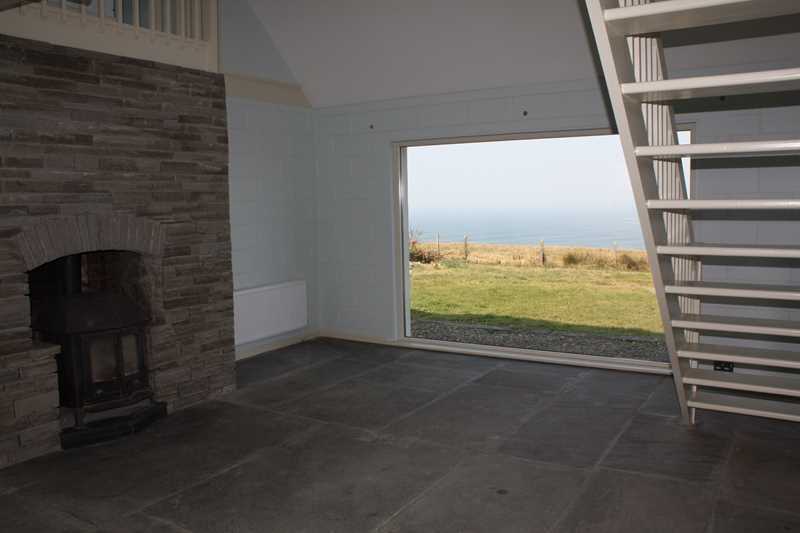 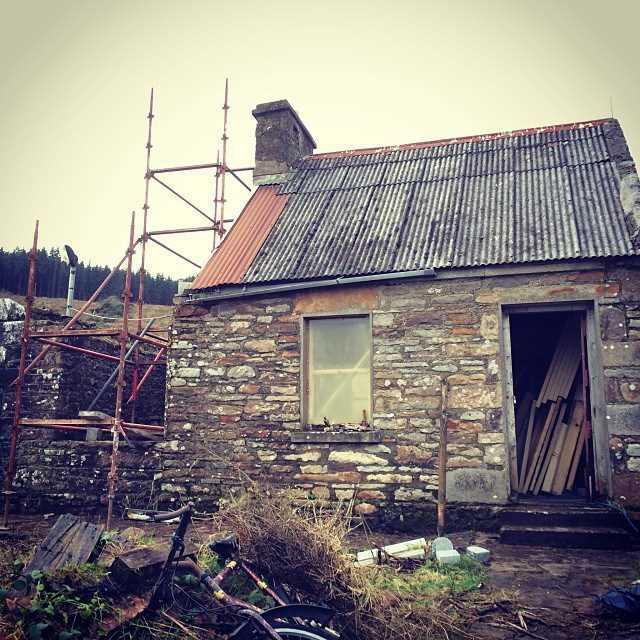 With quirky interior details and finishes - the derelict cottage has been brought back to life. 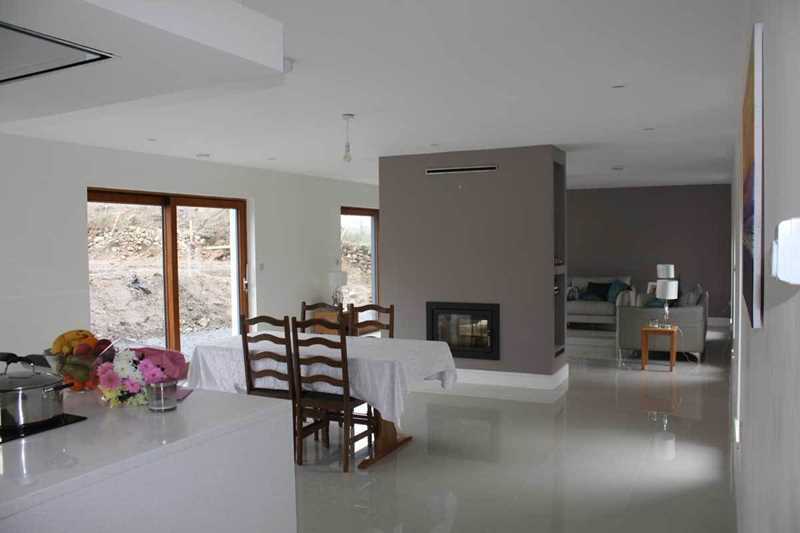 Click on the 'View More' button below to open the 'Tear Sheet' on this project. 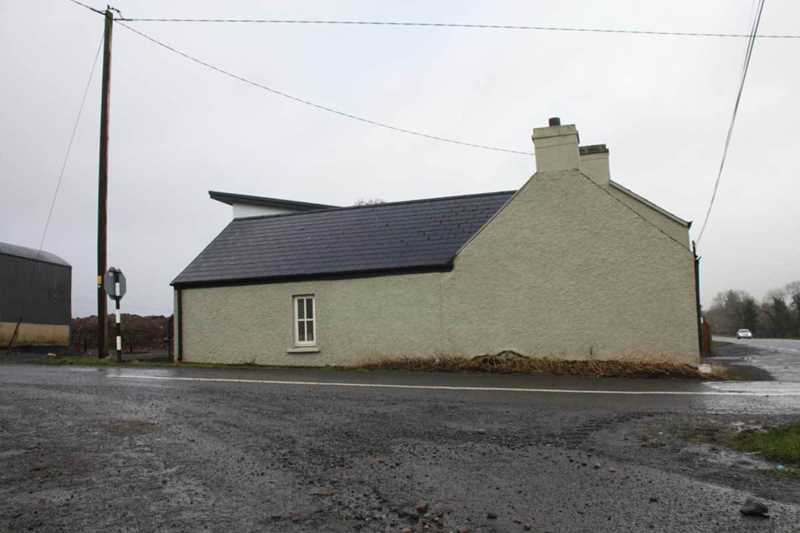 This project includes a 'double-pitched' extension and refurbishment to a traditional single storey Irish cottage in County Mayo which adds valuable additional space for a family in a small footprint Click on the 'View More' button below to open the 'Tear Sheet' on this project. 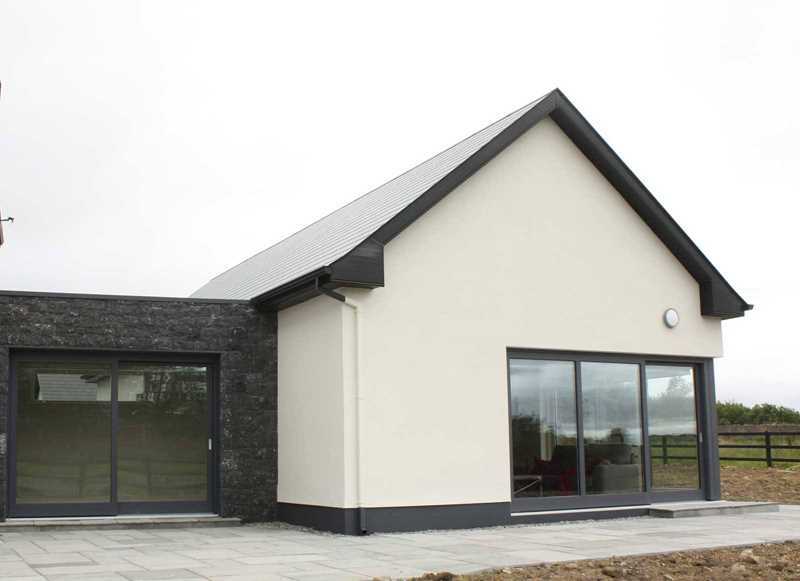 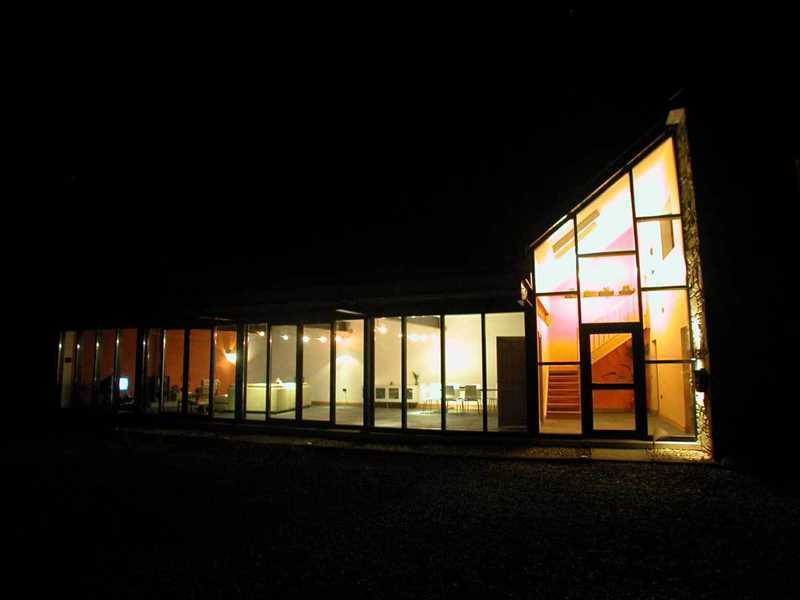 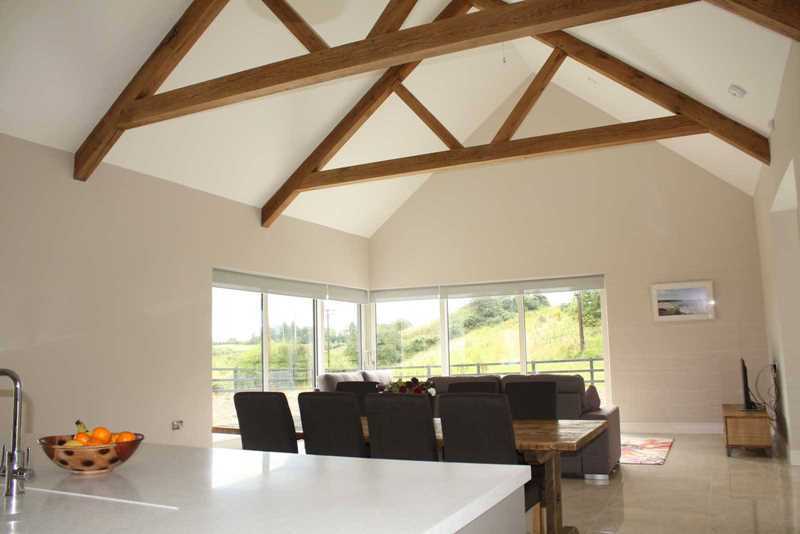 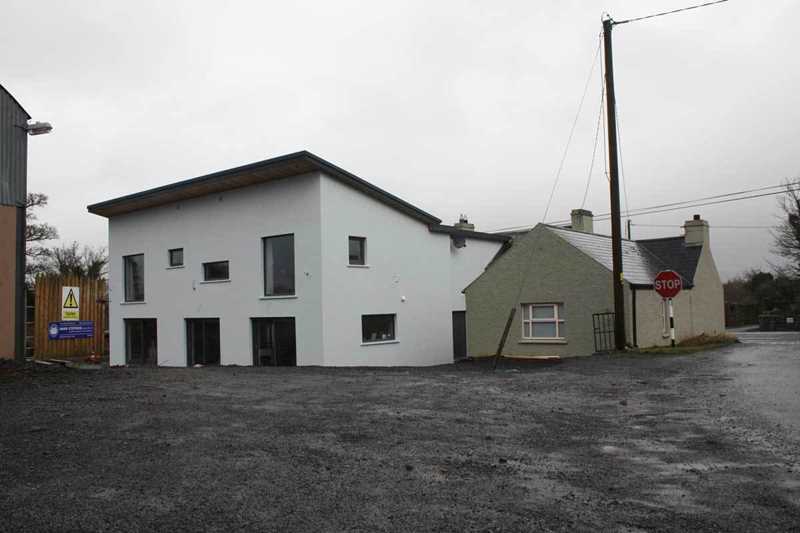 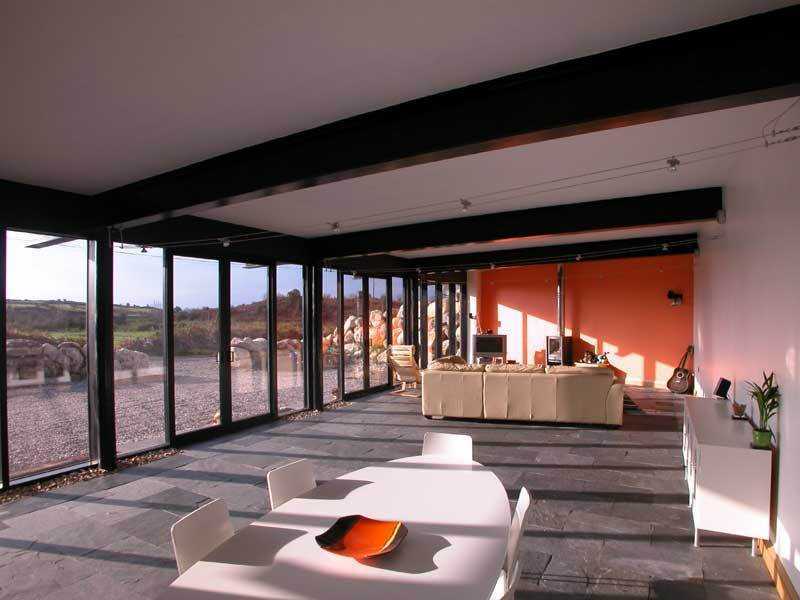 A mono-pitched contemporary extension to a traditional two storey County Sligo Irish farmhouse. 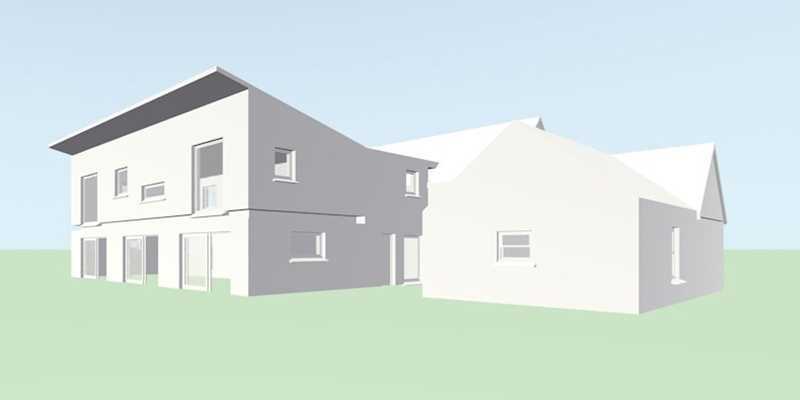 Click on the 'View More' button below to open the 'Tear Sheet' on this project.